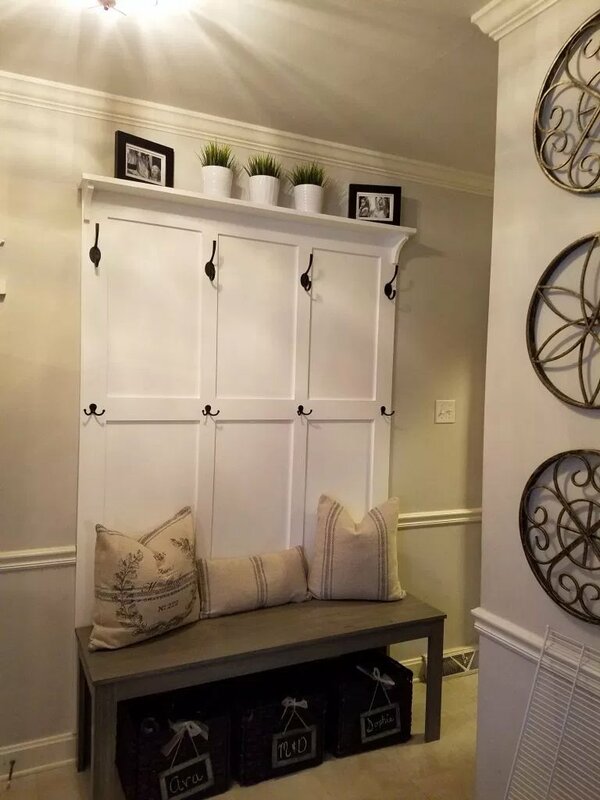 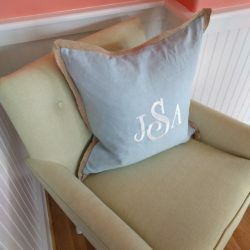 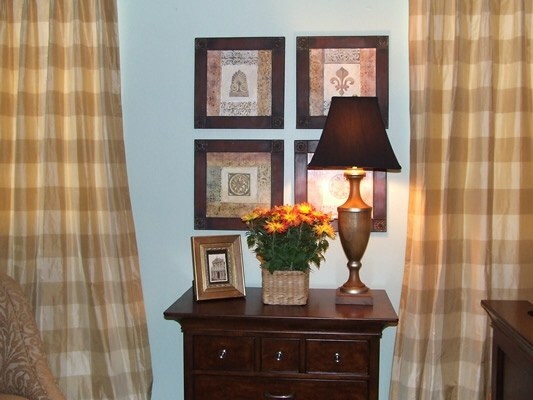 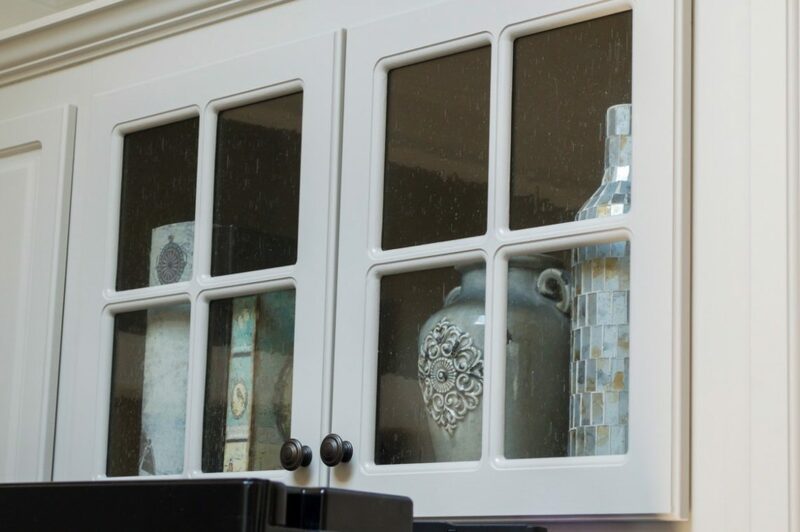 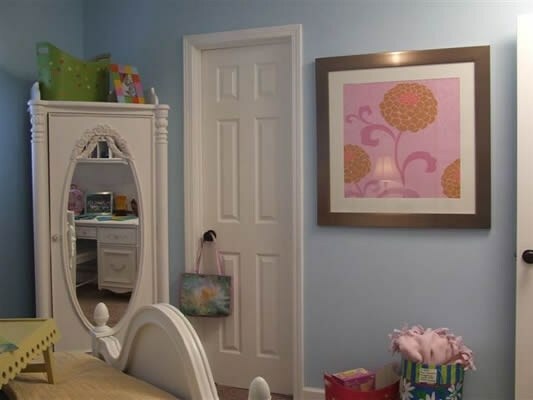 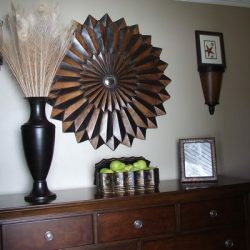 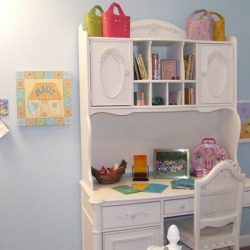 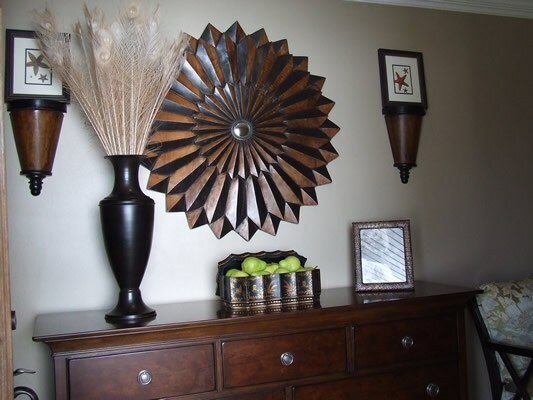 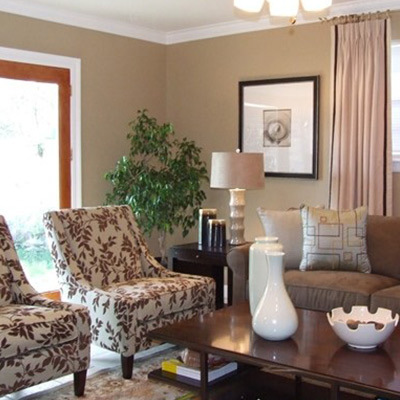 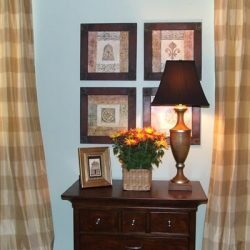 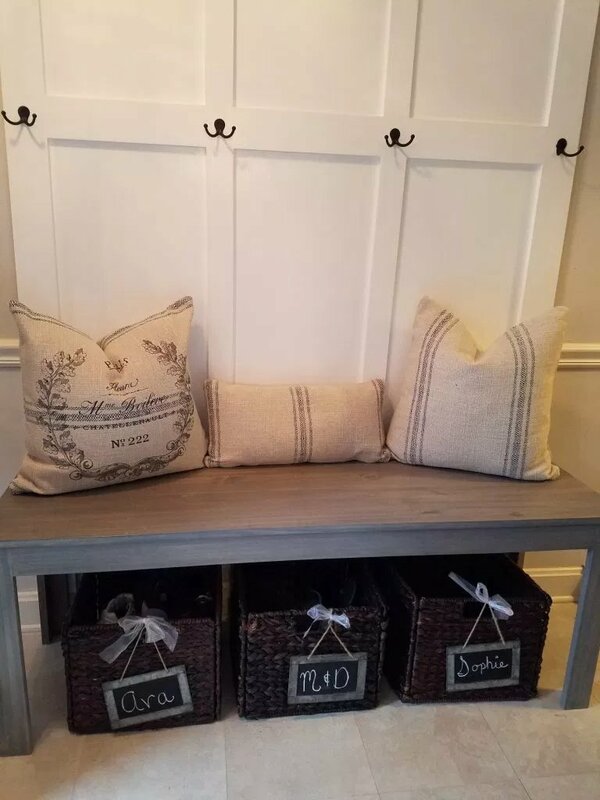 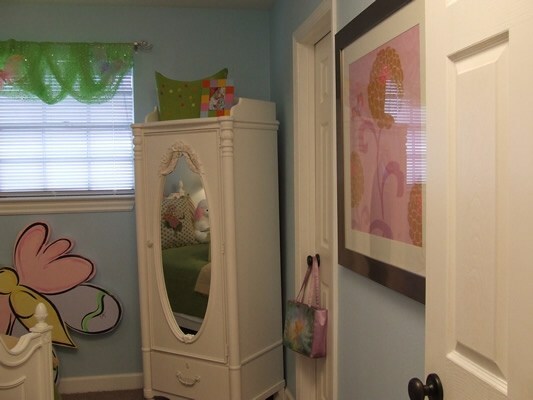 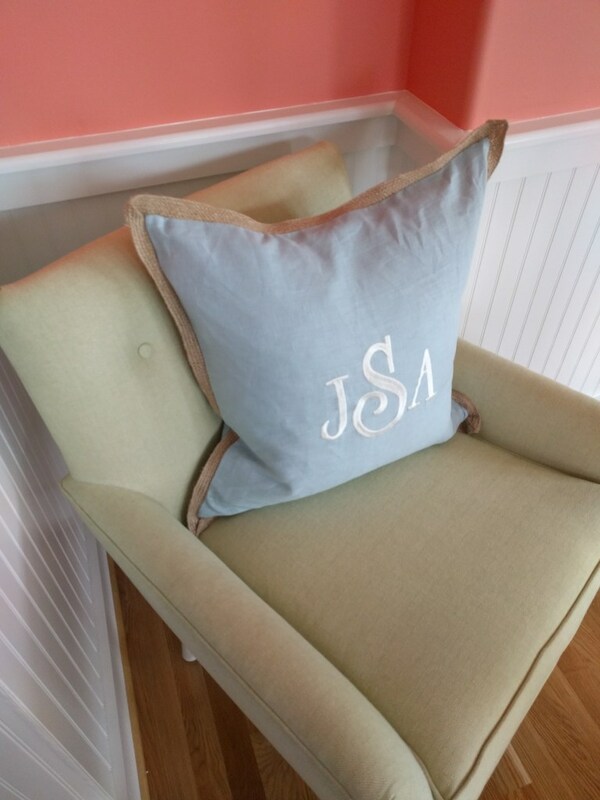 Have a piece in your home that you find difficult to style around? 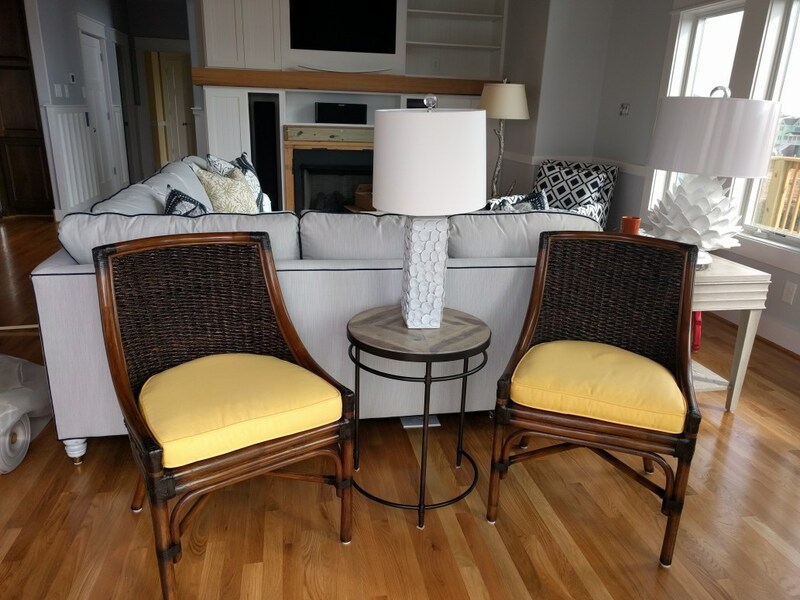 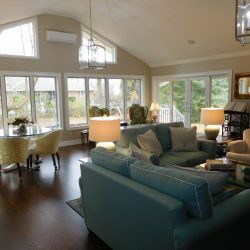 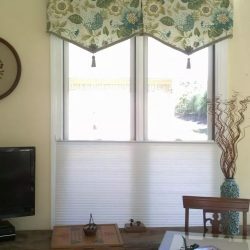 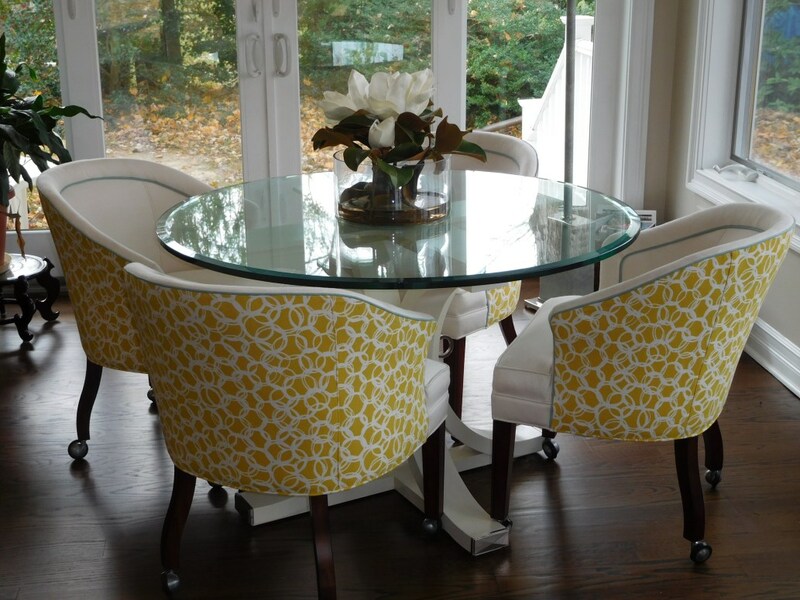 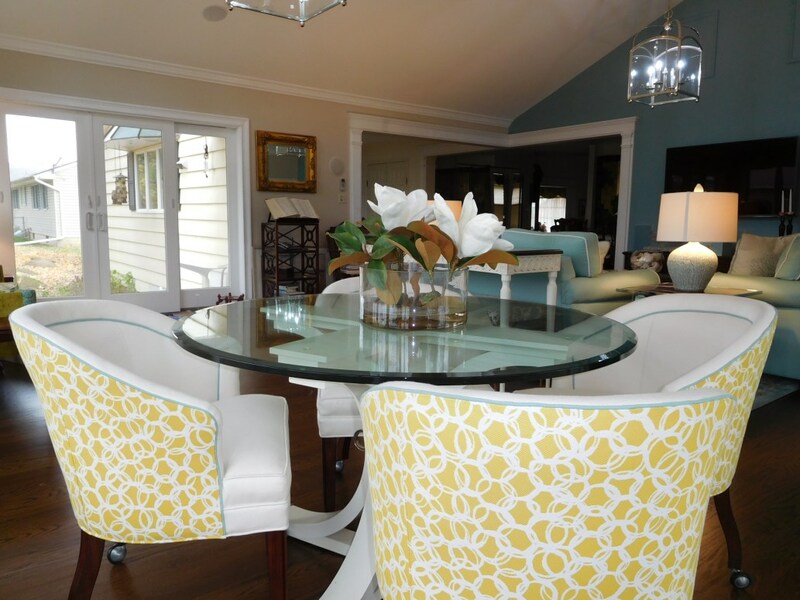 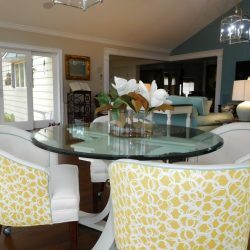 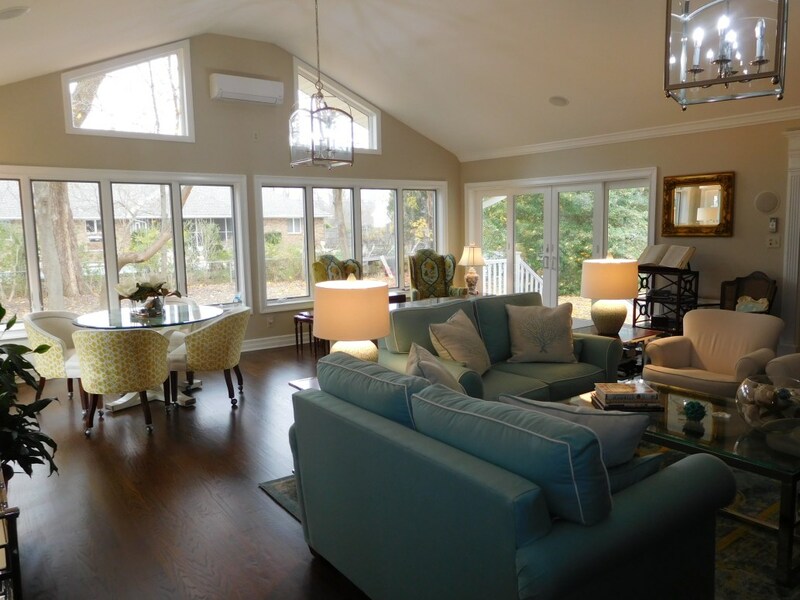 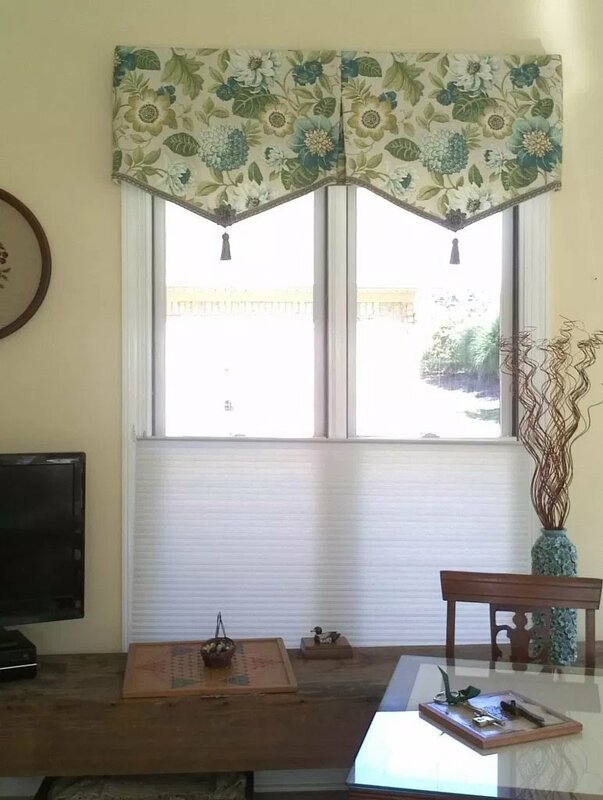 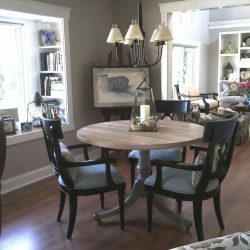 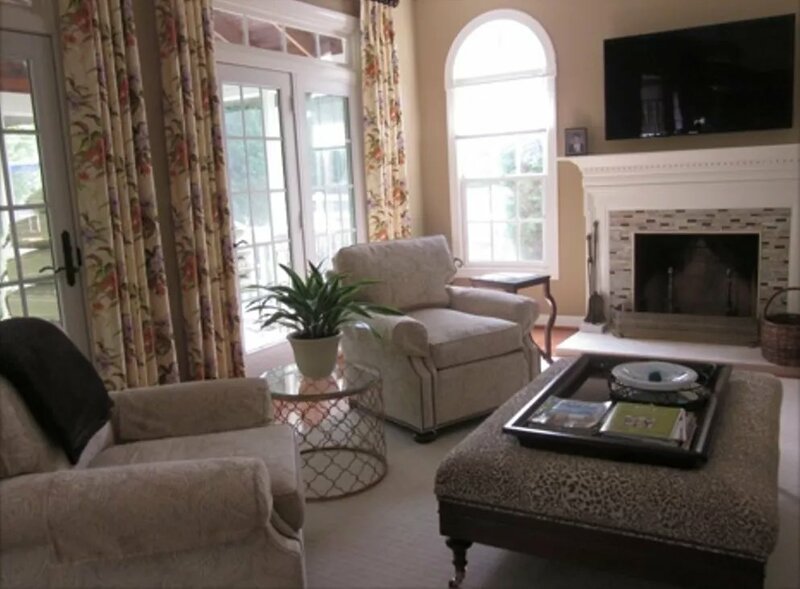 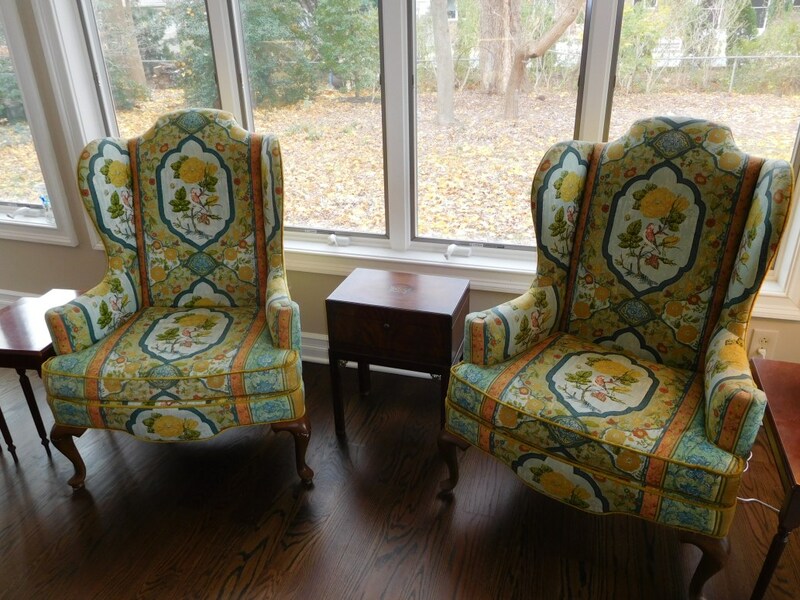 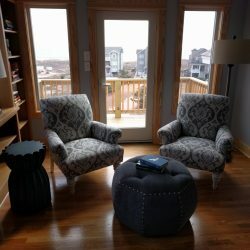 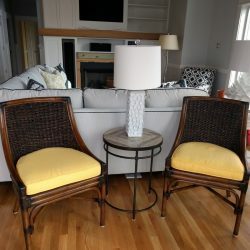 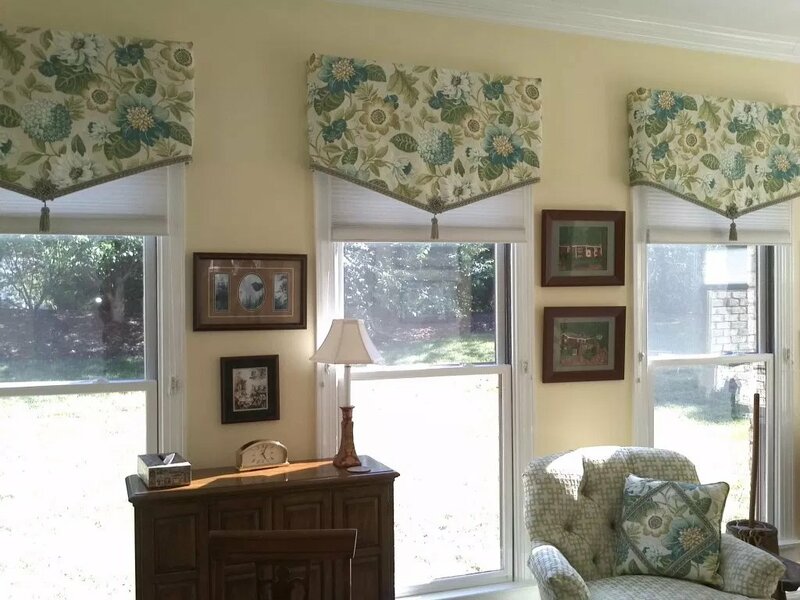 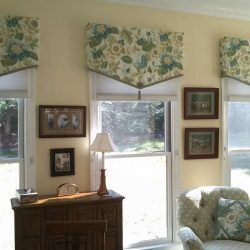 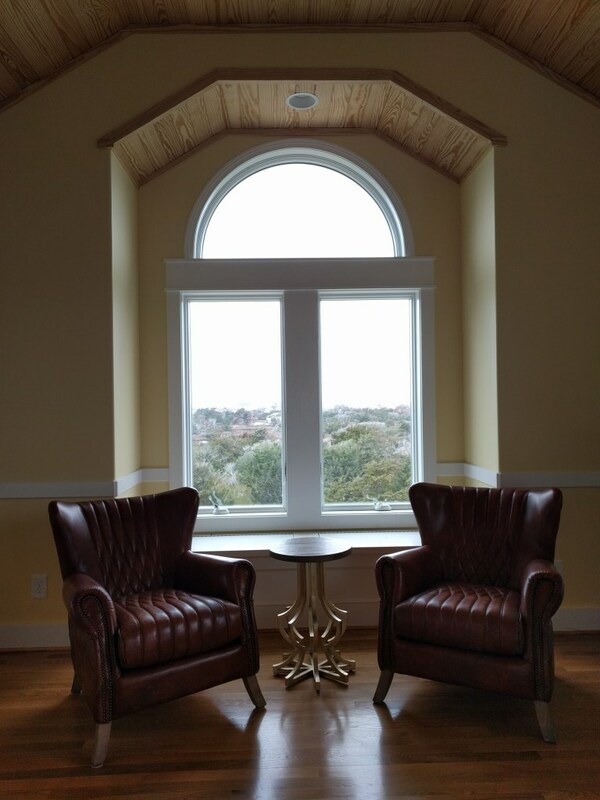 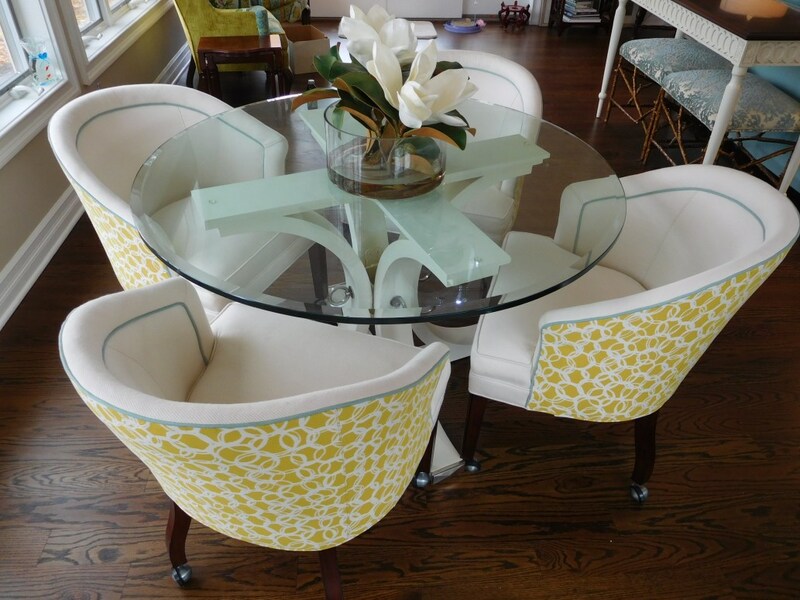 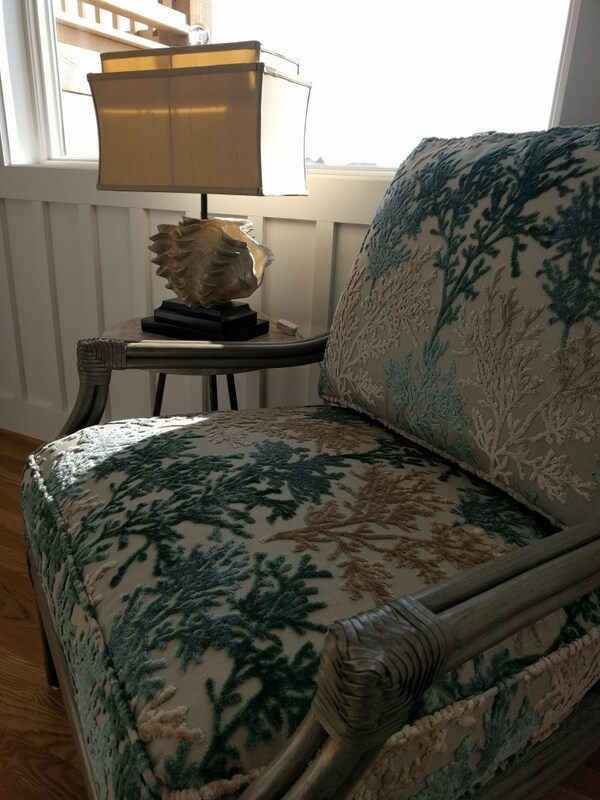 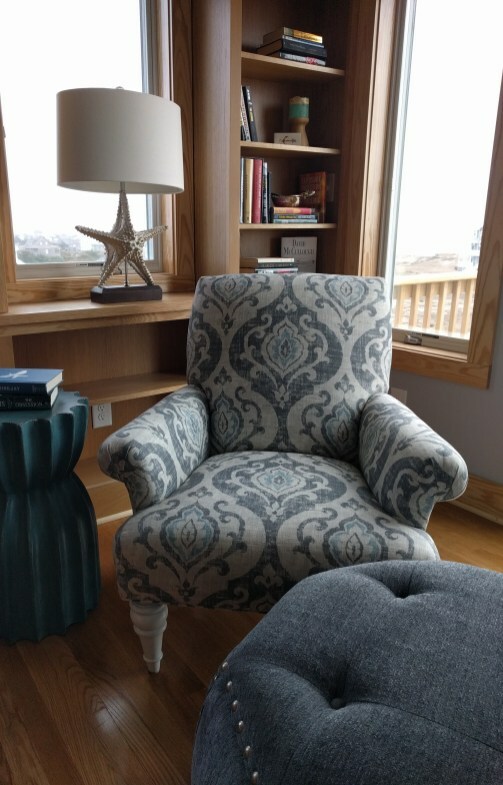 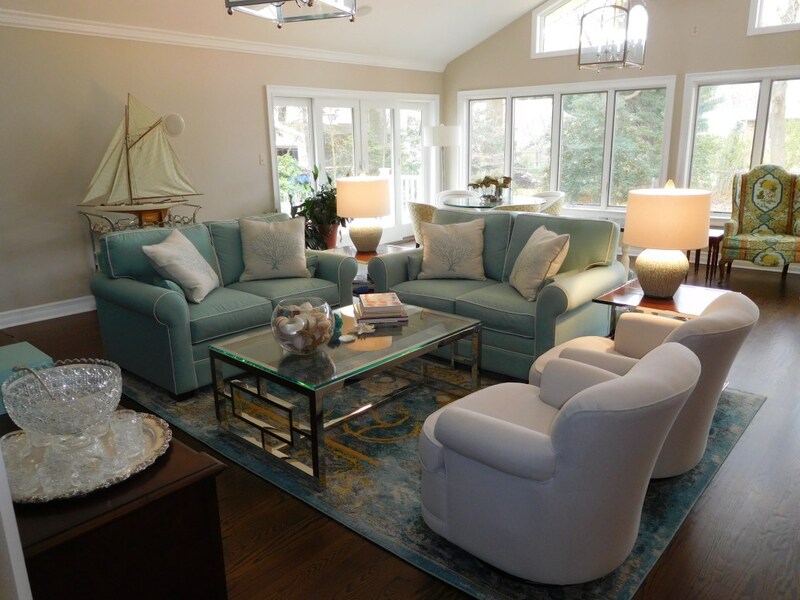 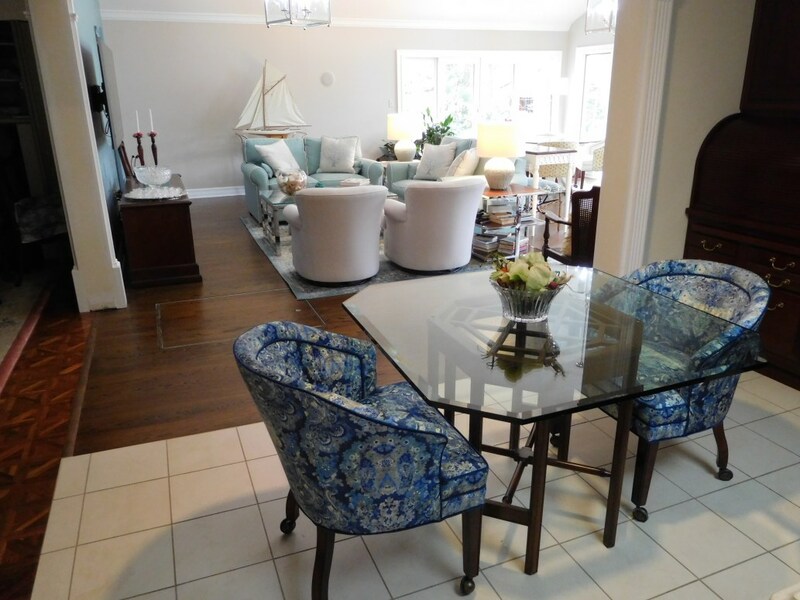 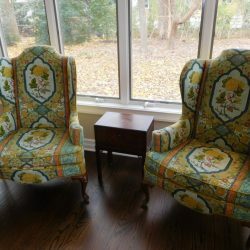 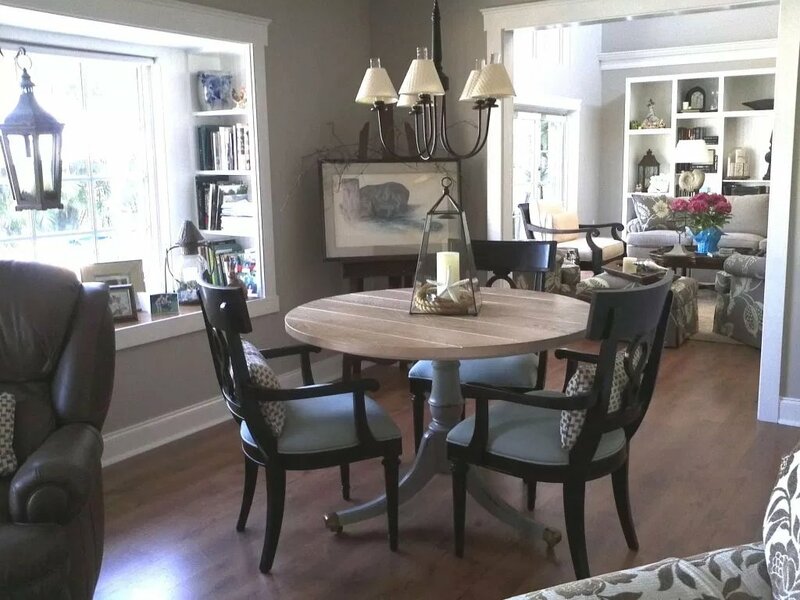 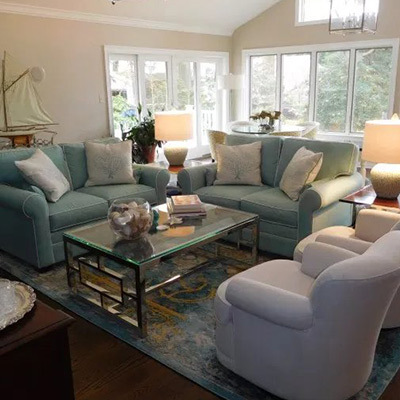 Our clients have two cheery yellow chairs that they wanted Kathy Gordon Interiors to use as a jumping off point this amazingly open and airy sunroom, while still keeping the space open, coastal, and full of light. 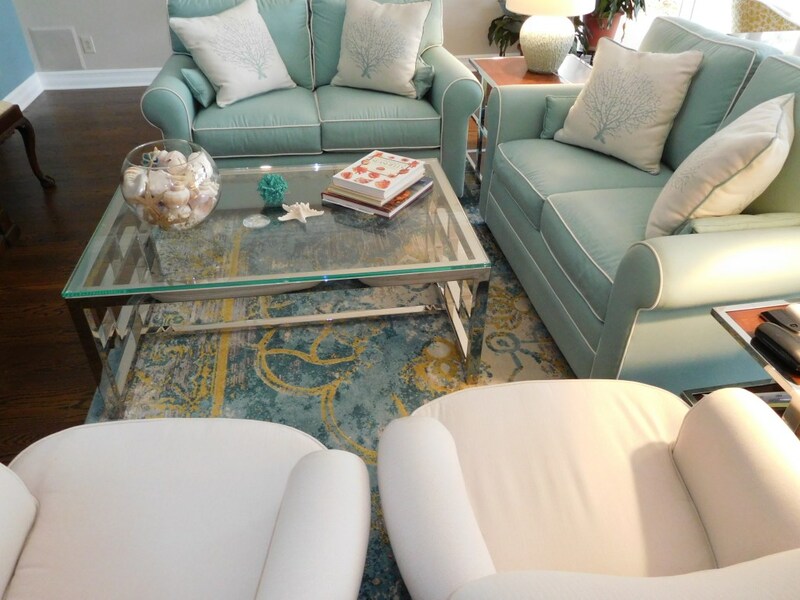 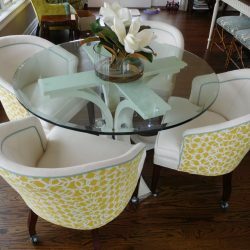 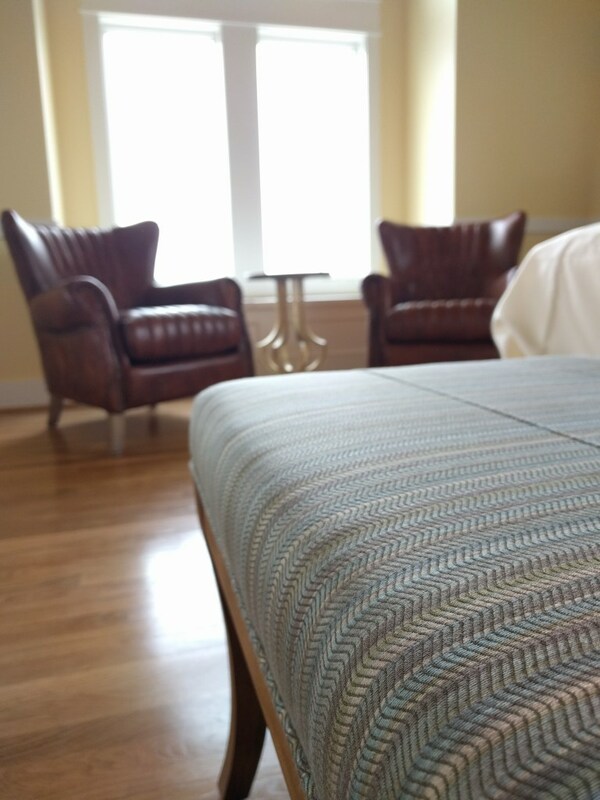 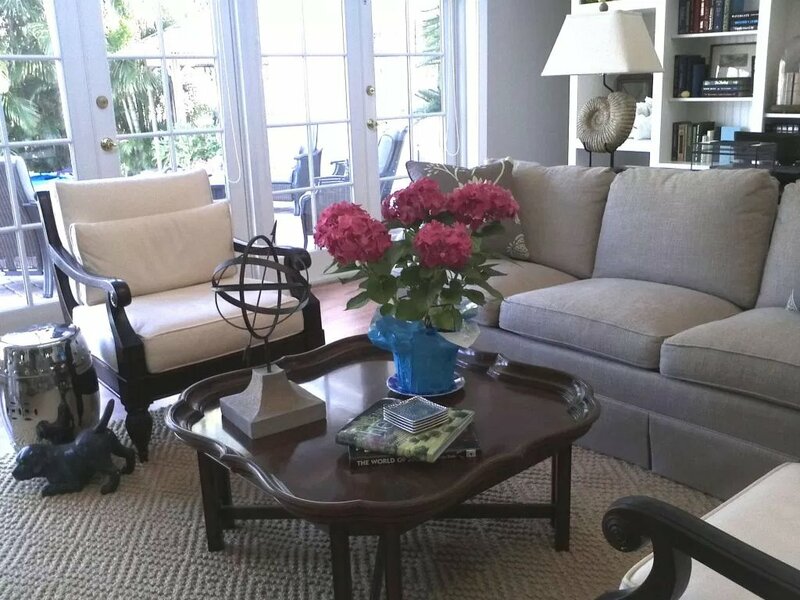 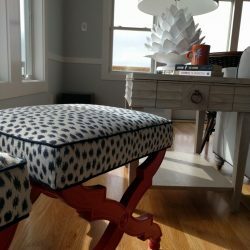 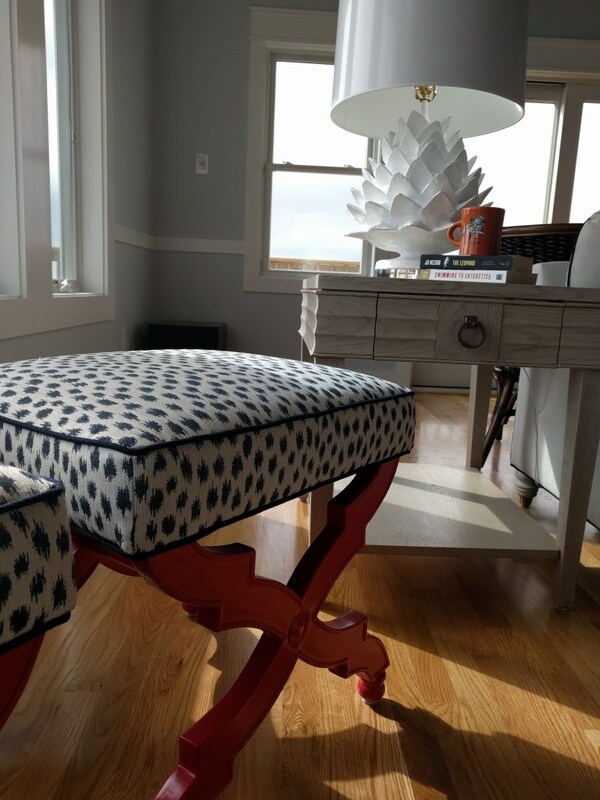 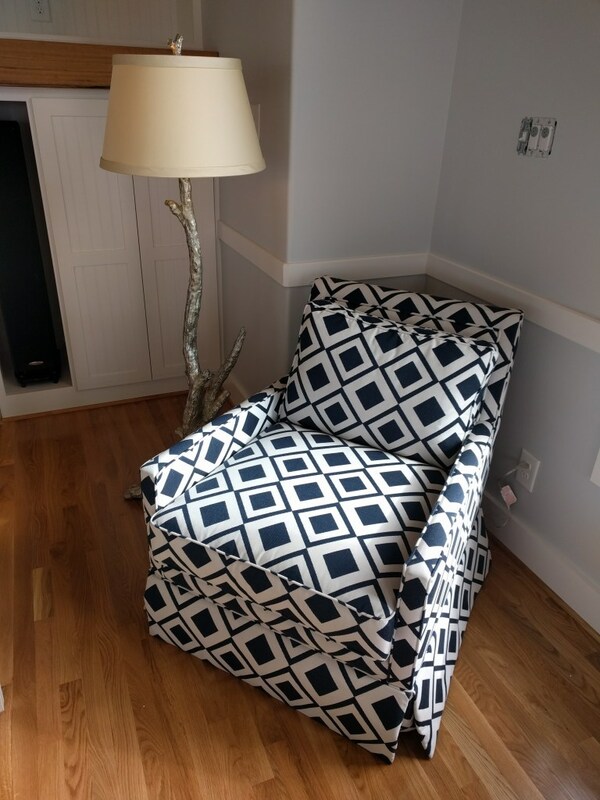 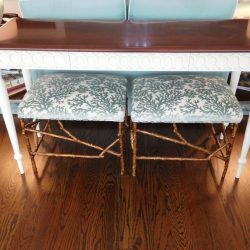 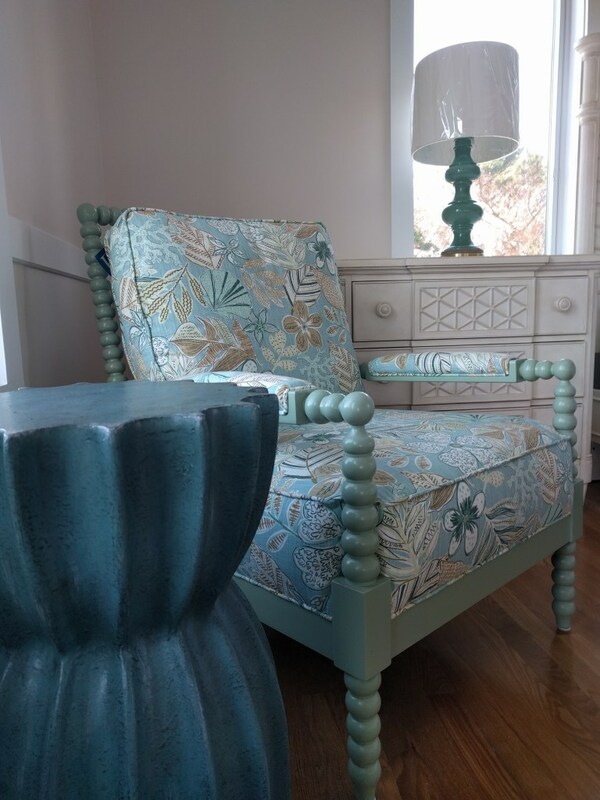 We were able to bring in fun prints and sculptural details (check out those gorgeous branching ottomans!) 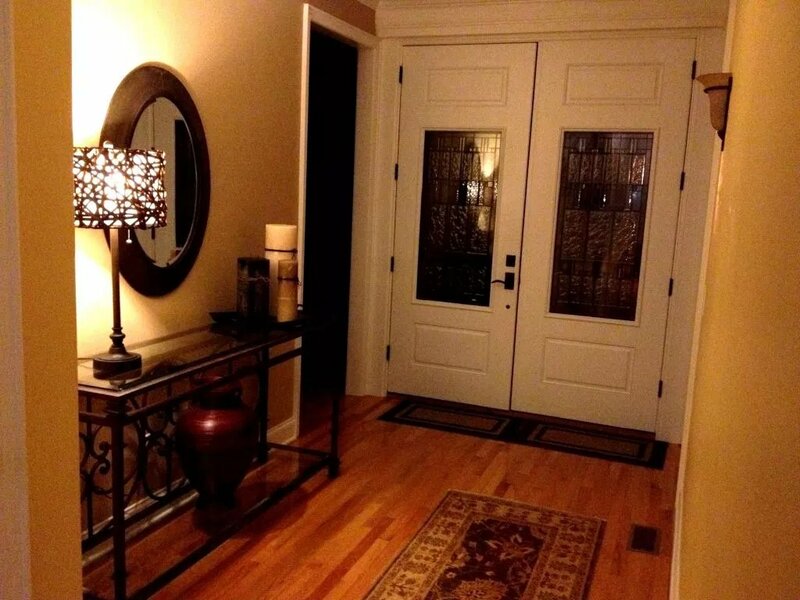 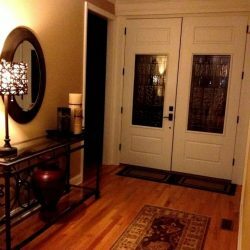 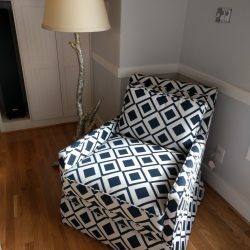 that made the space glamorous, without feeling stuffy. 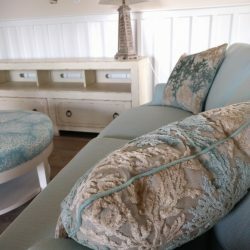 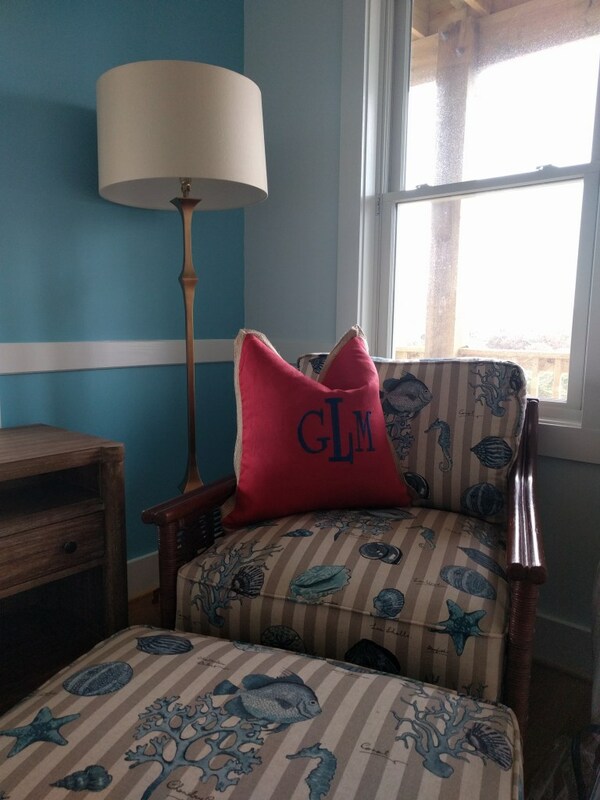 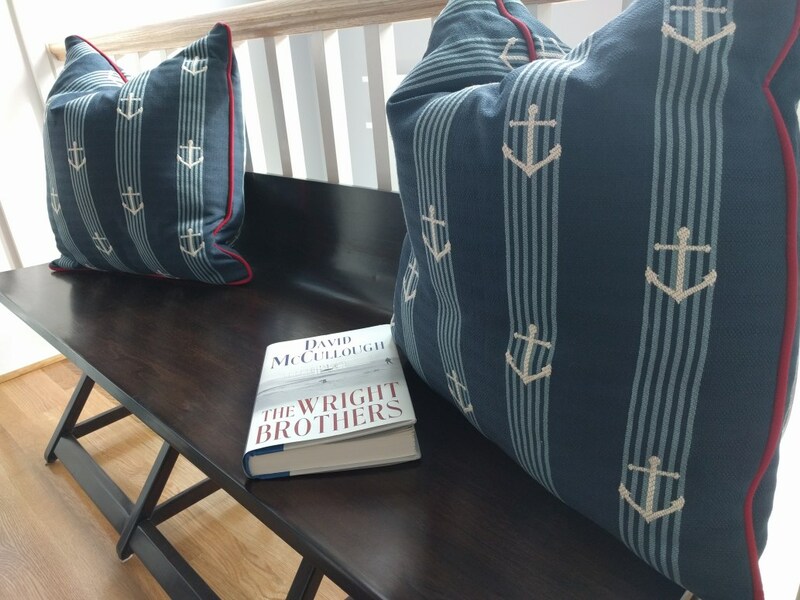 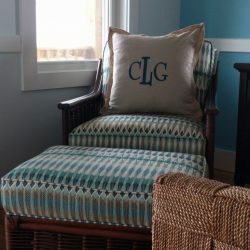 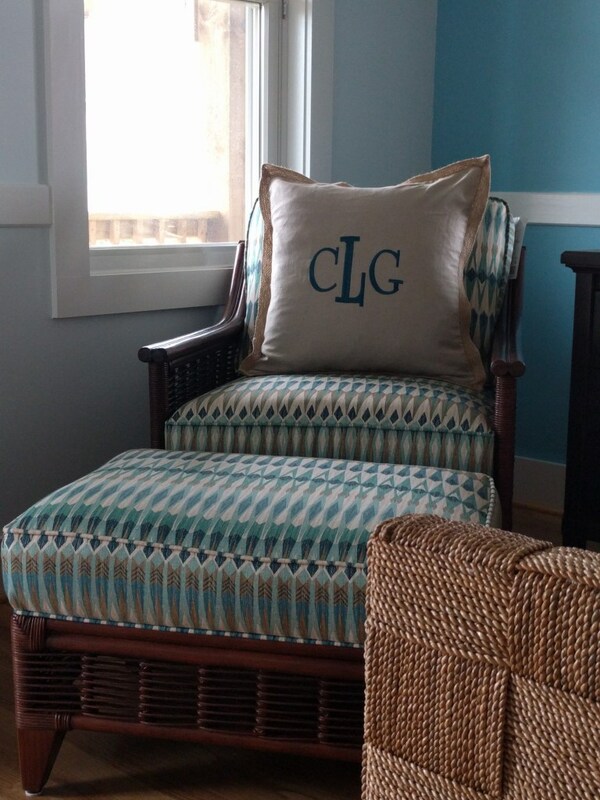 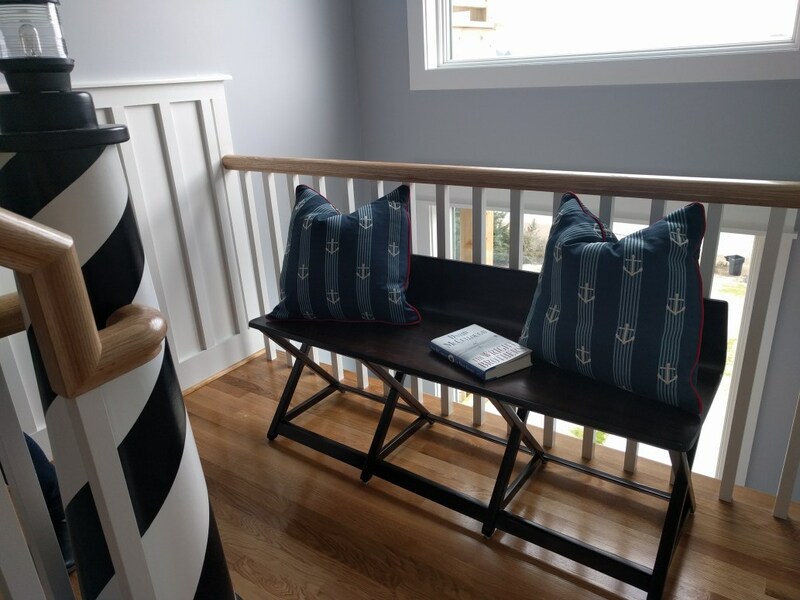 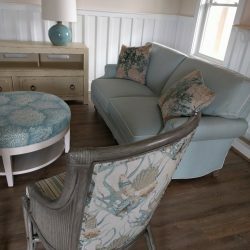 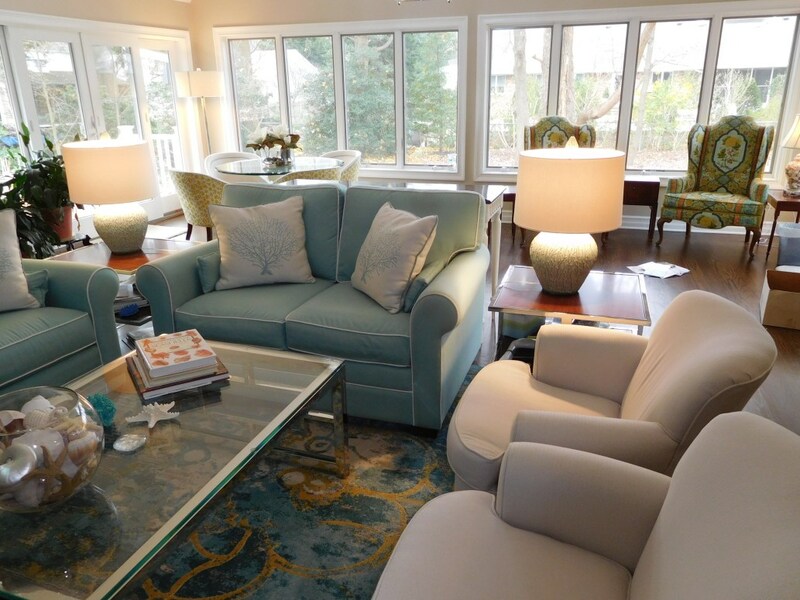 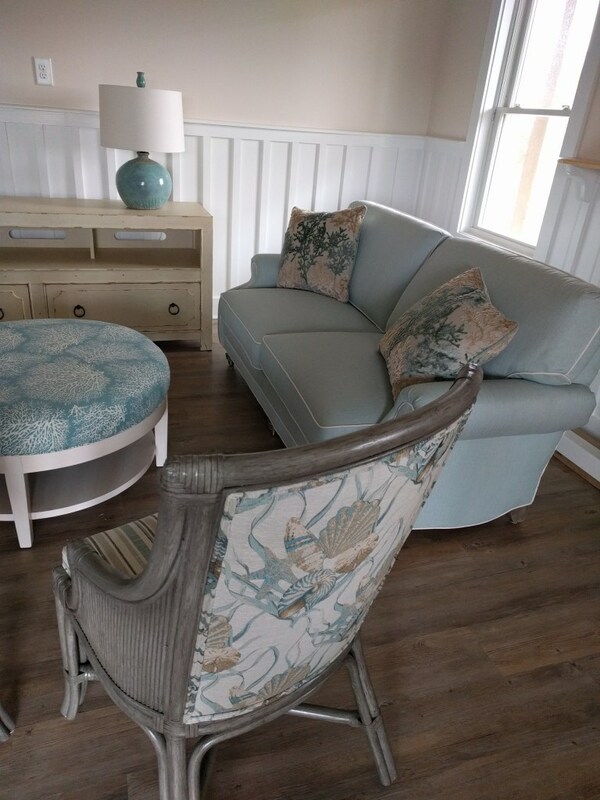 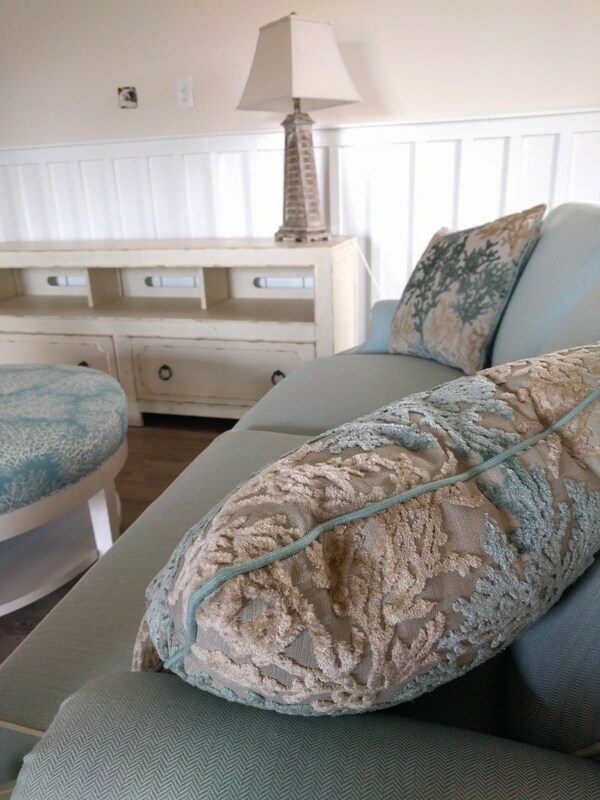 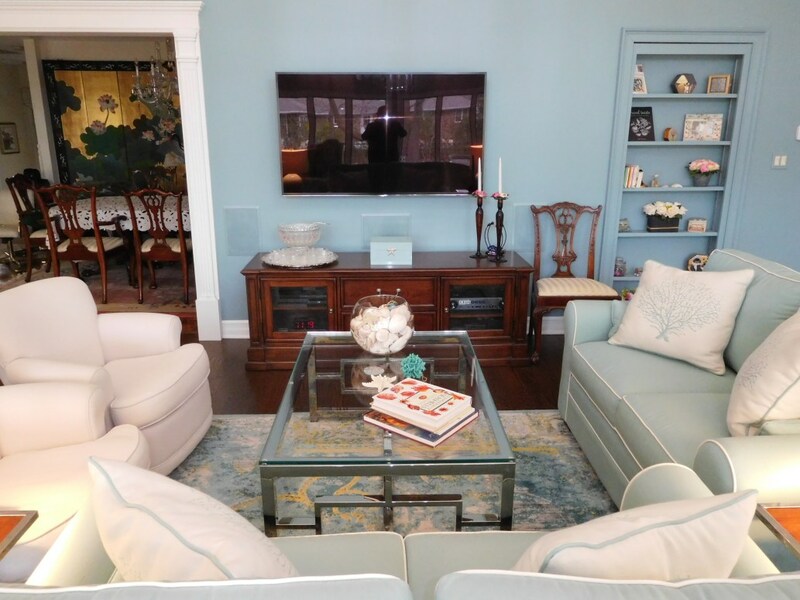 Our clients’ pre-existing blue wall helped inspire the light blues and bright whites that help make their sunroom the ultimate beach hang-out spot. 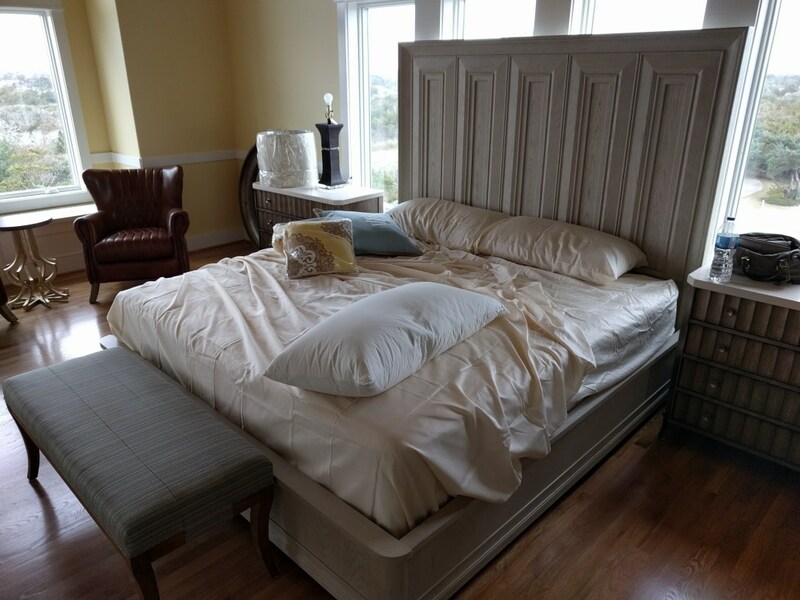 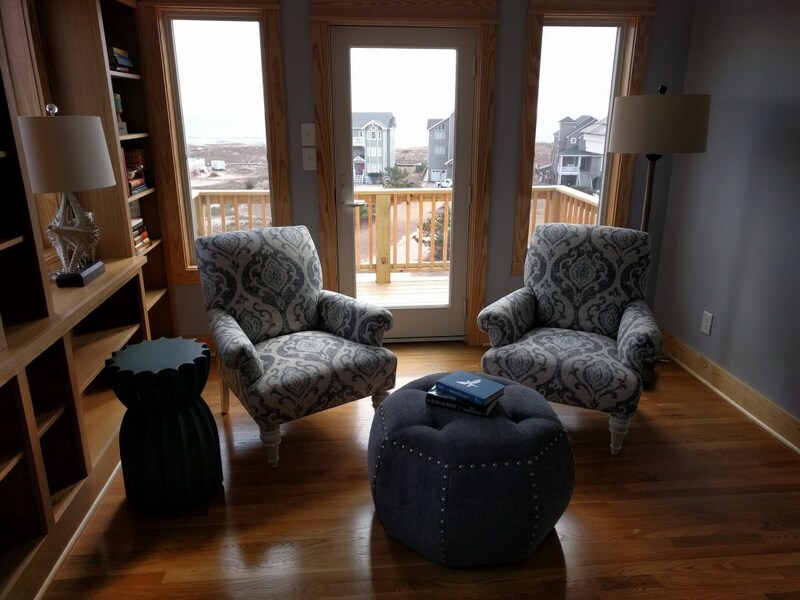 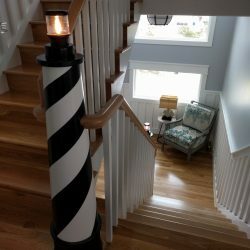 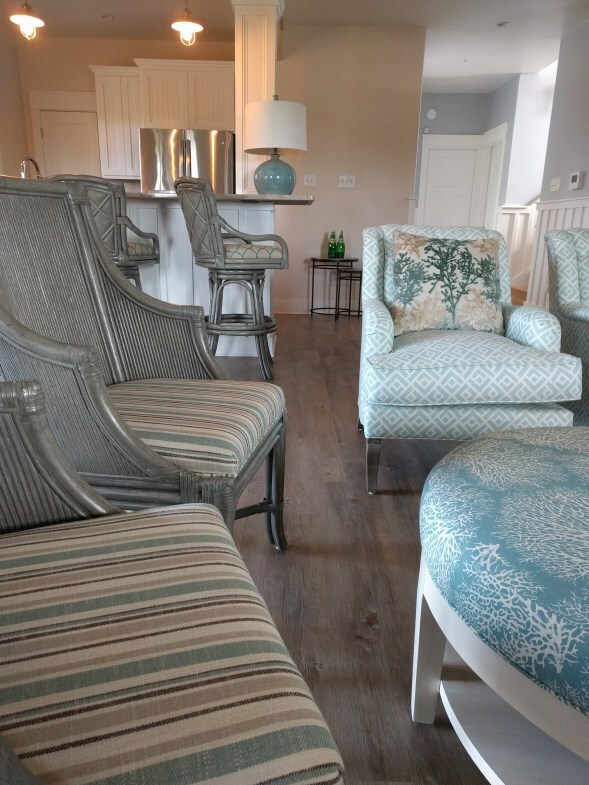 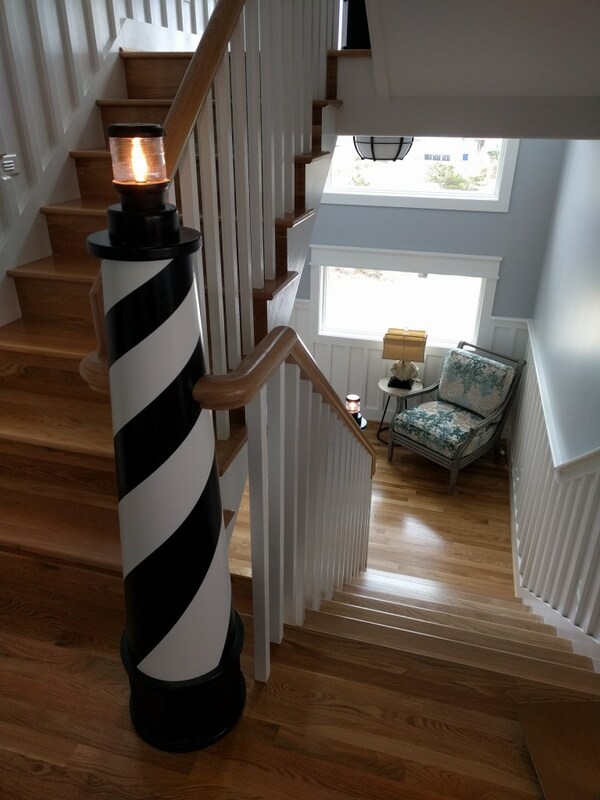 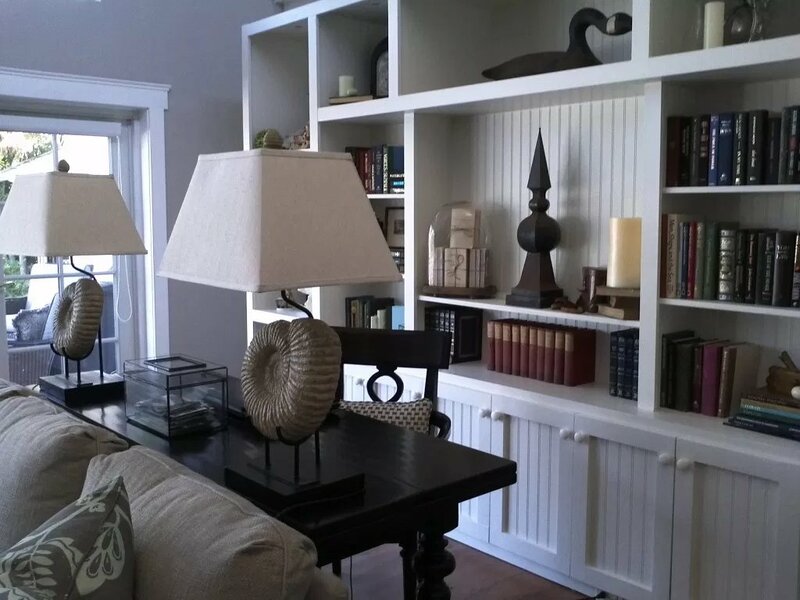 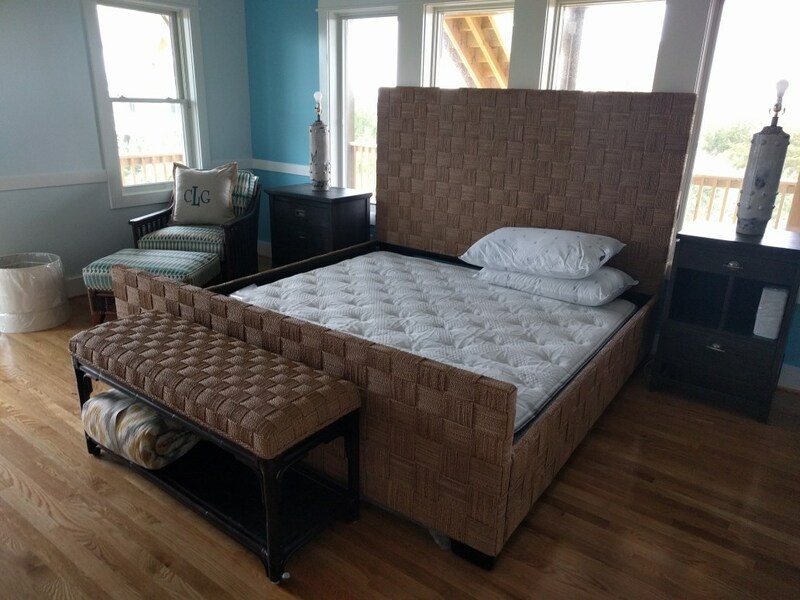 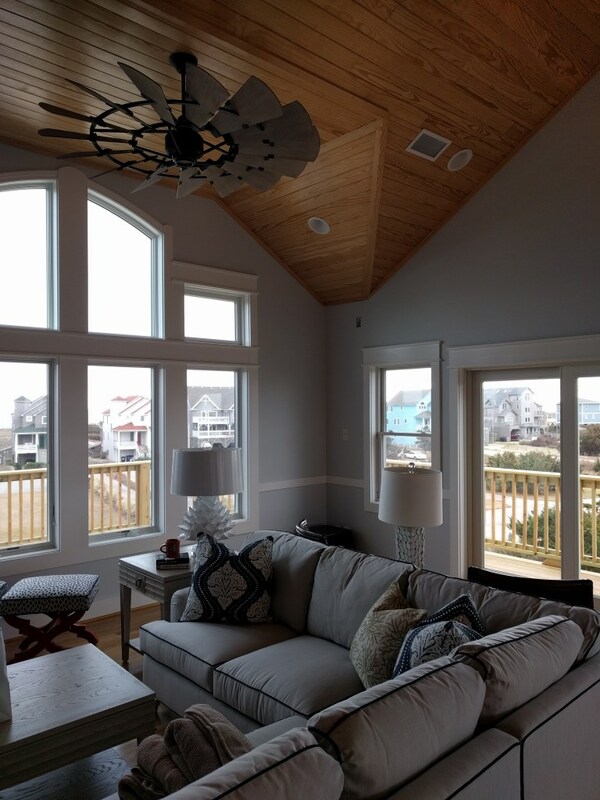 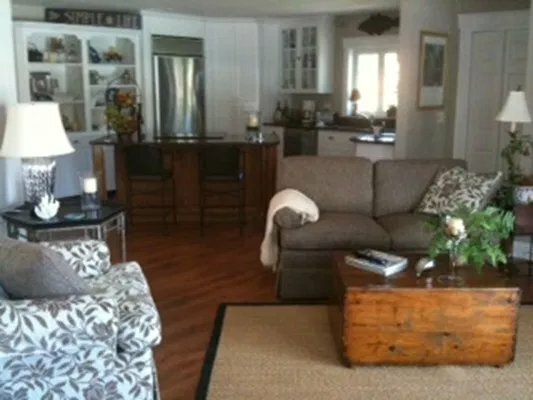 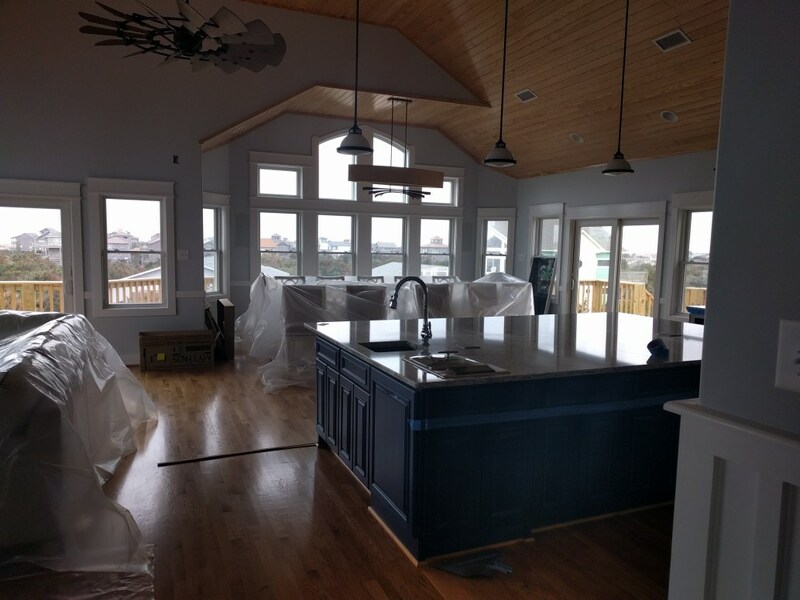 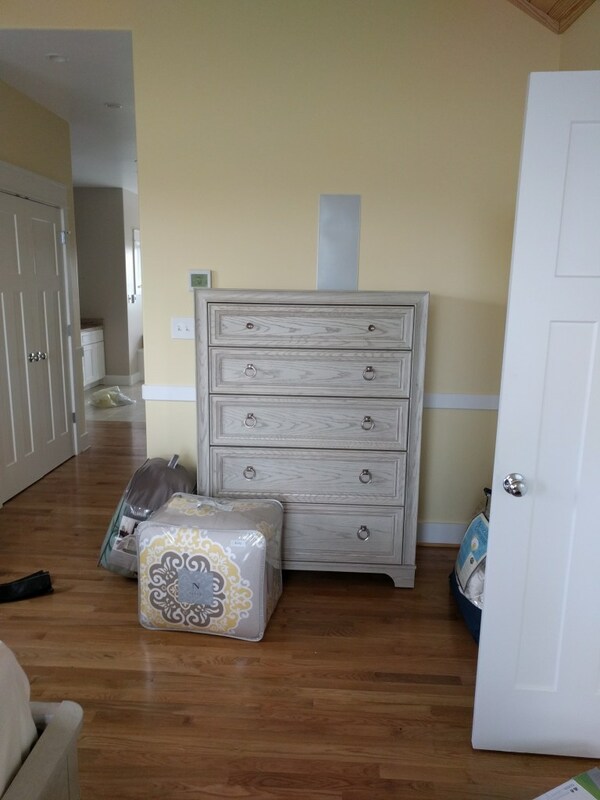 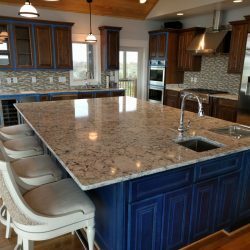 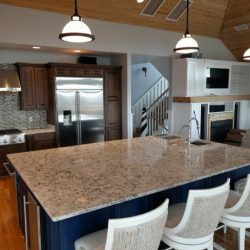 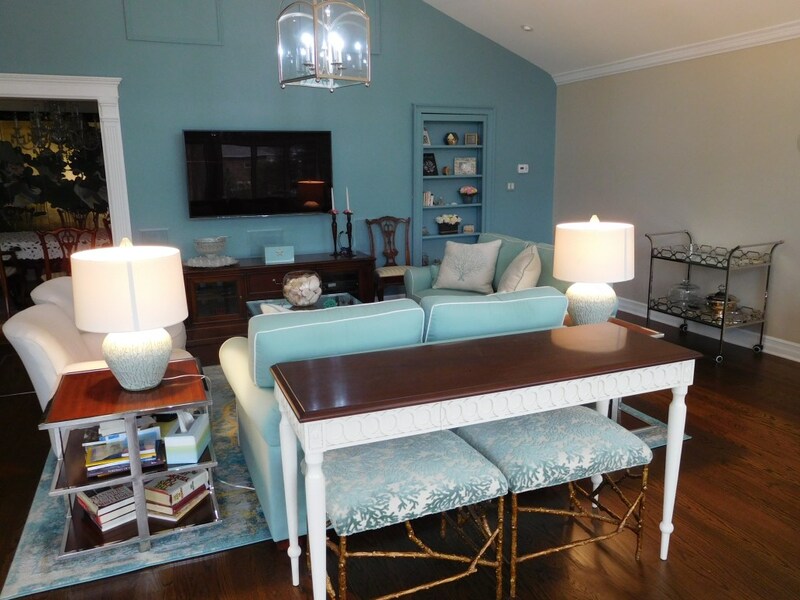 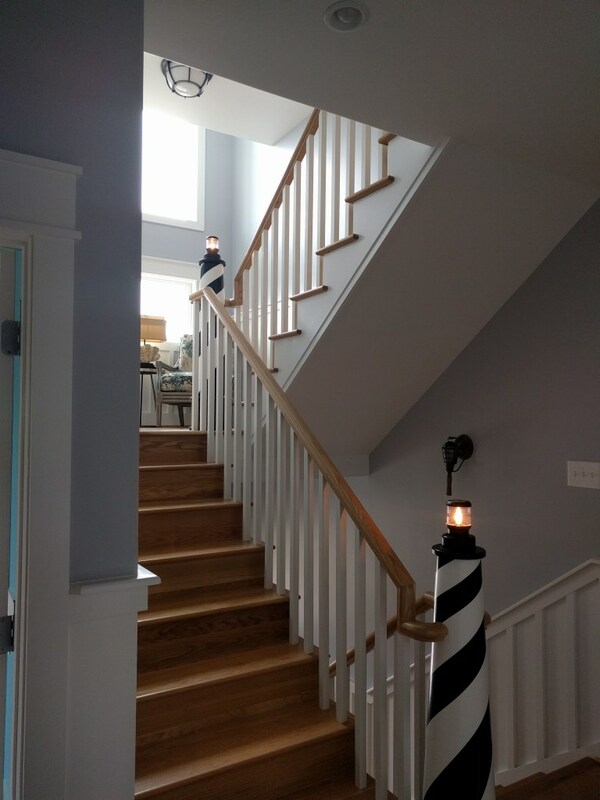 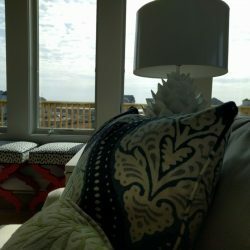 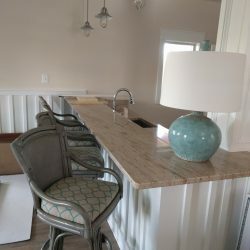 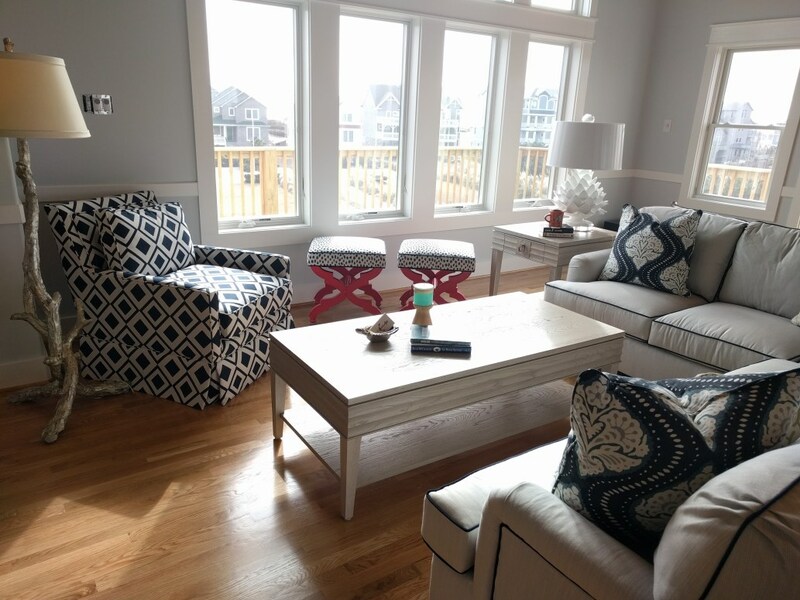 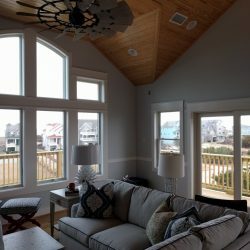 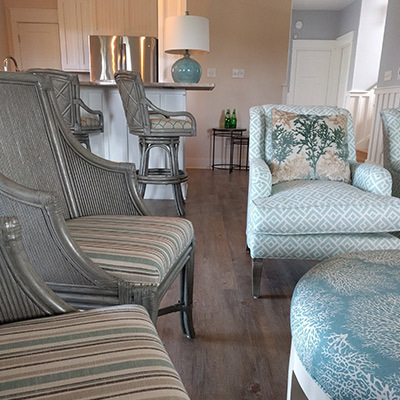 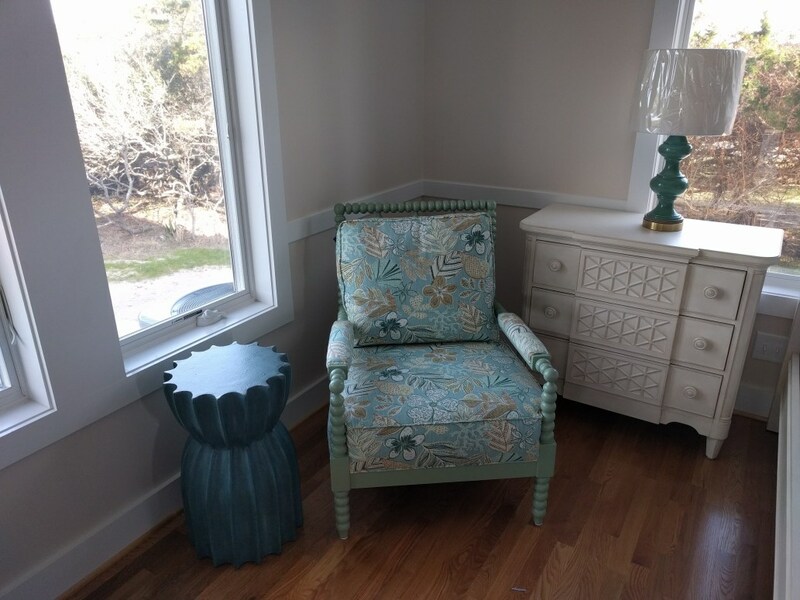 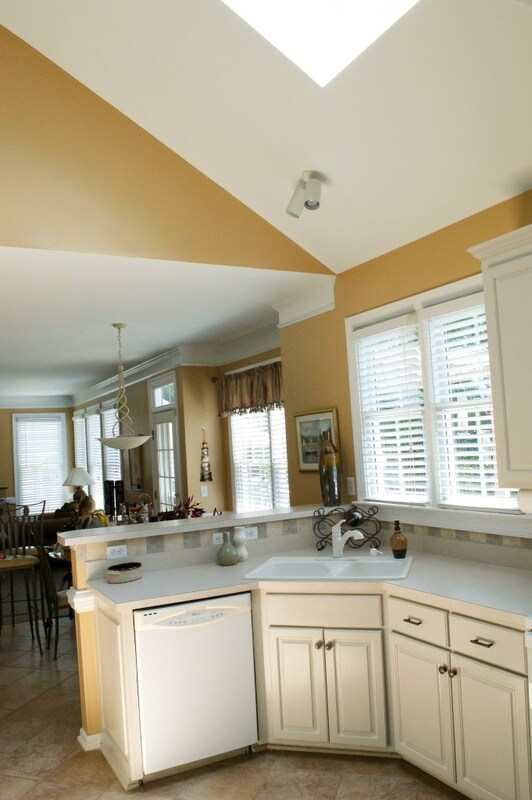 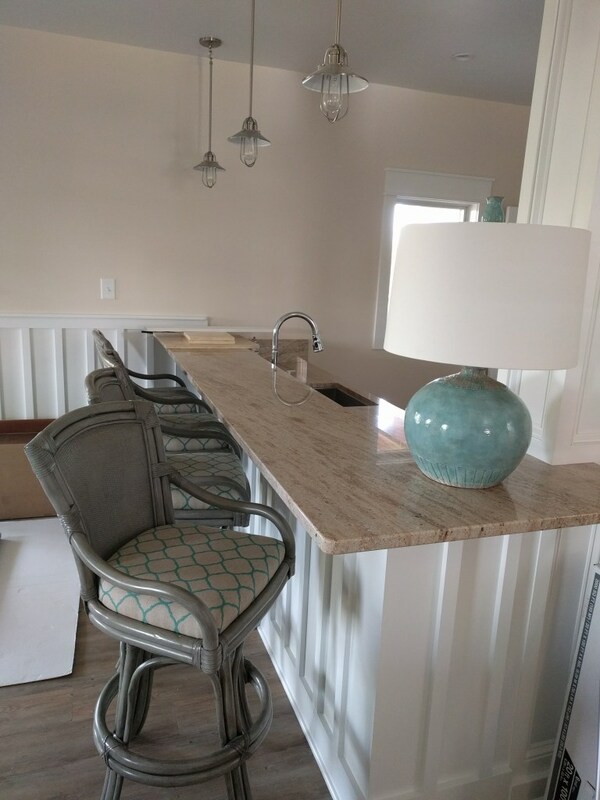 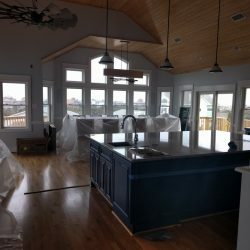 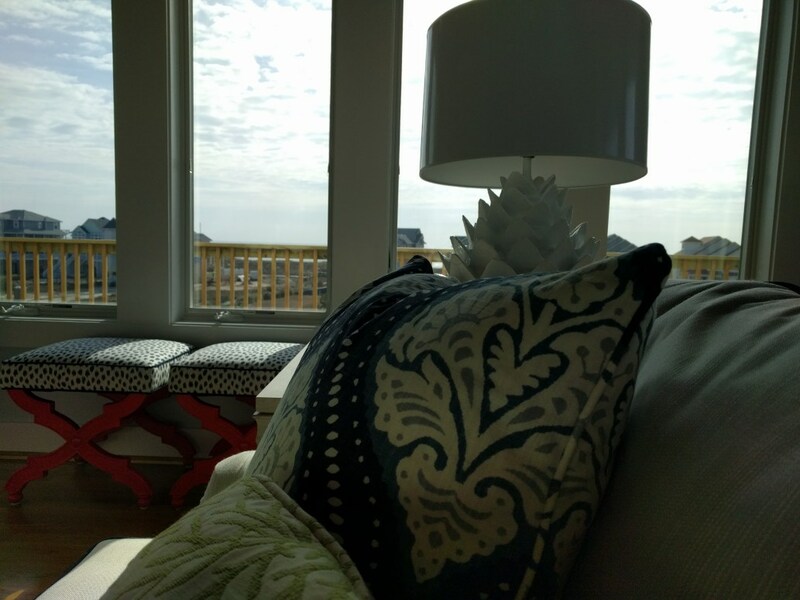 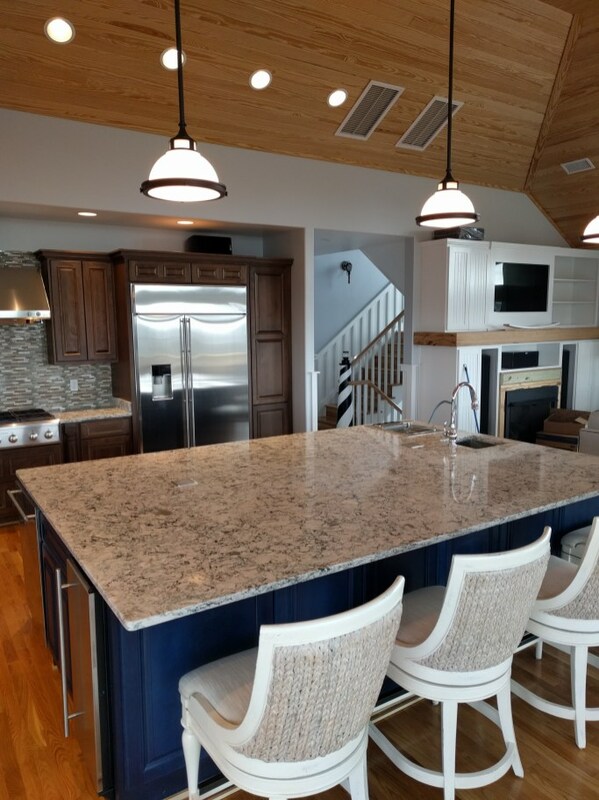 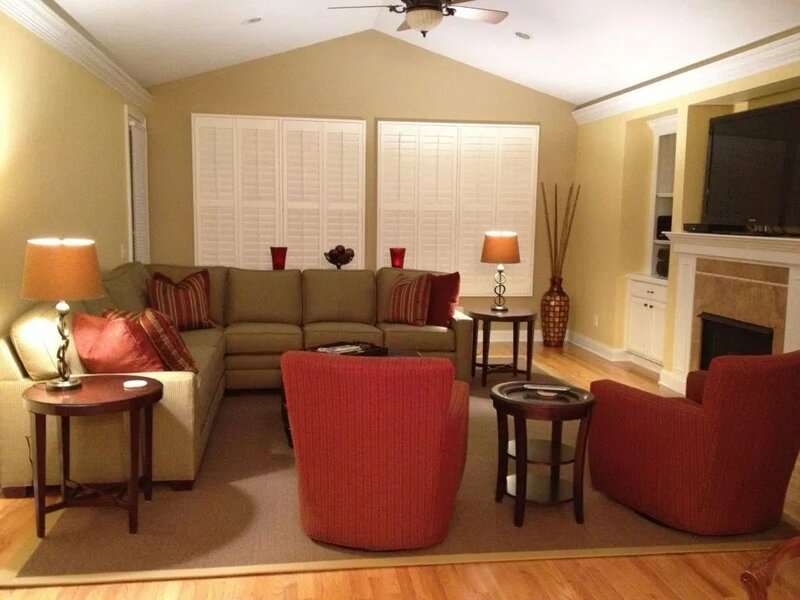 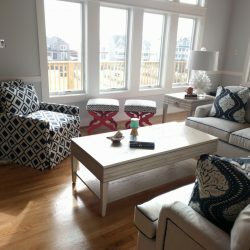 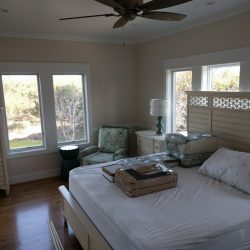 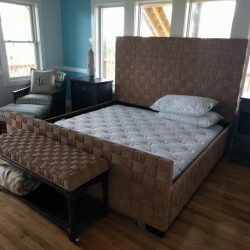 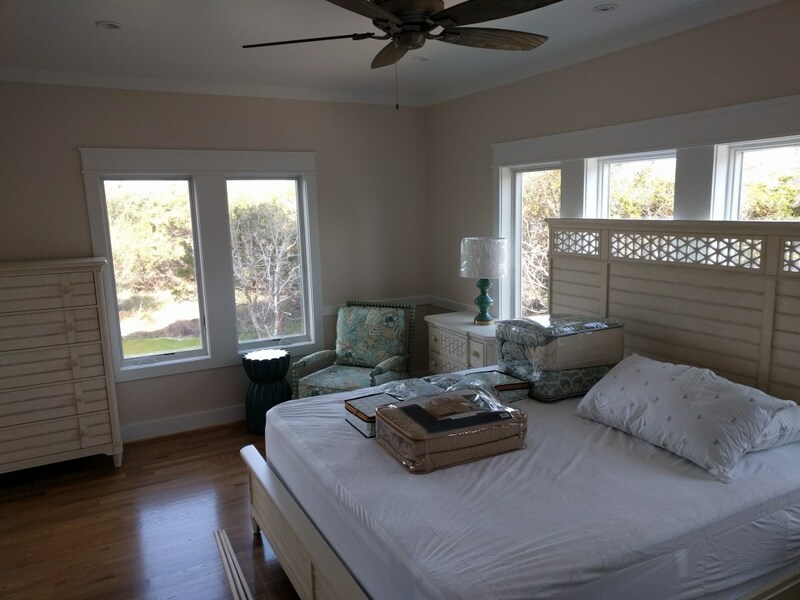 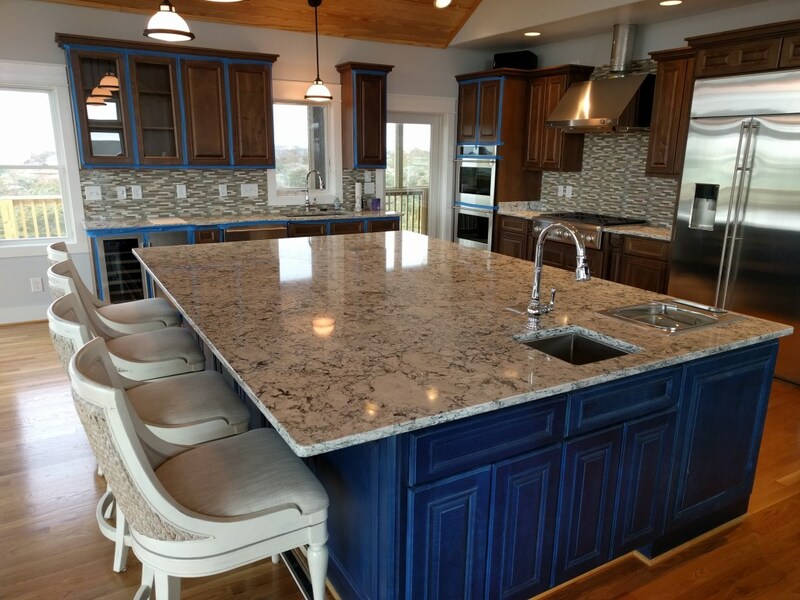 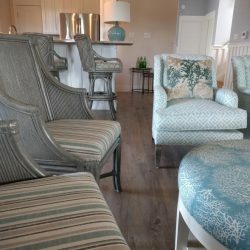 Check out this top to bottom home that Kathy Gordon Interiors had the privilege of working on in the Outerbanks of North Carolina! 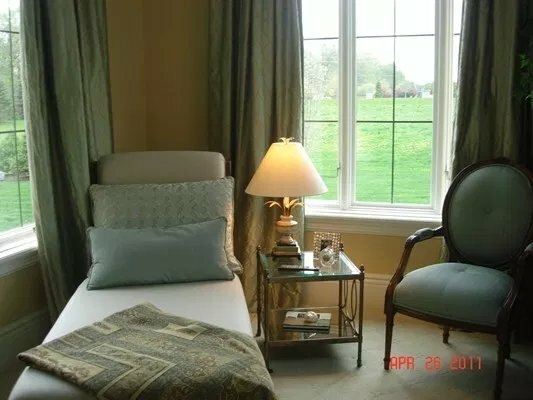 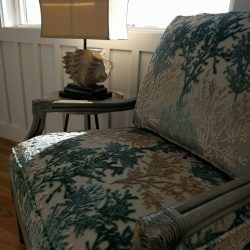 Every room was furnished with a mixture of textures, prints, and finishes, creating fun variances throughout the space while still preserving the character and flow of the homeowners. 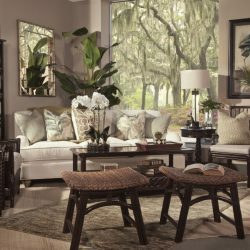 Every year Braxton-Culler and Ashley Interiors hosts a contest exclusively for the Interior Design Trade in High Point, North Carolina. 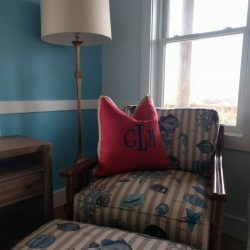 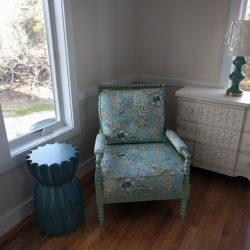 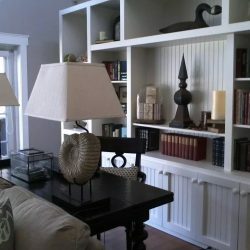 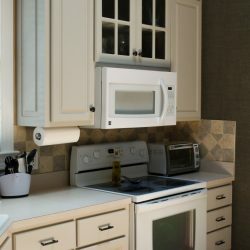 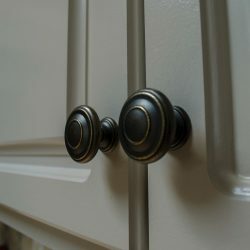 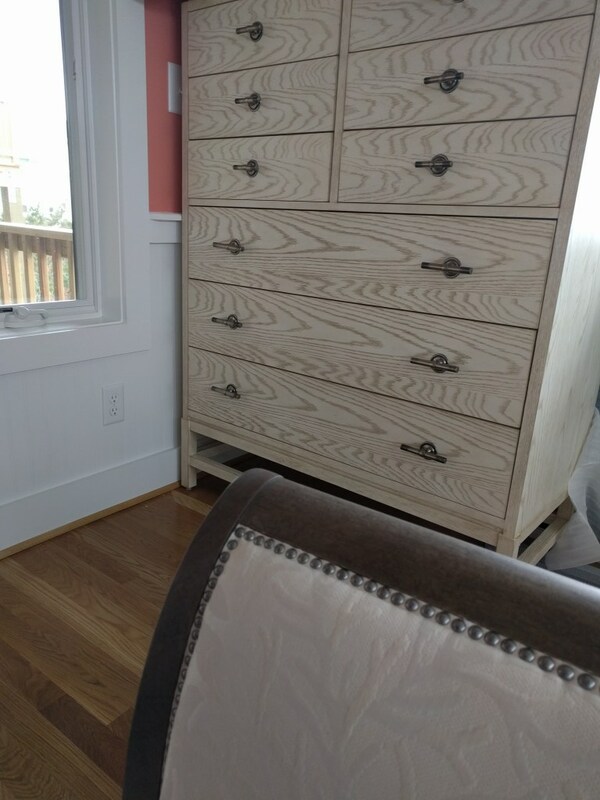 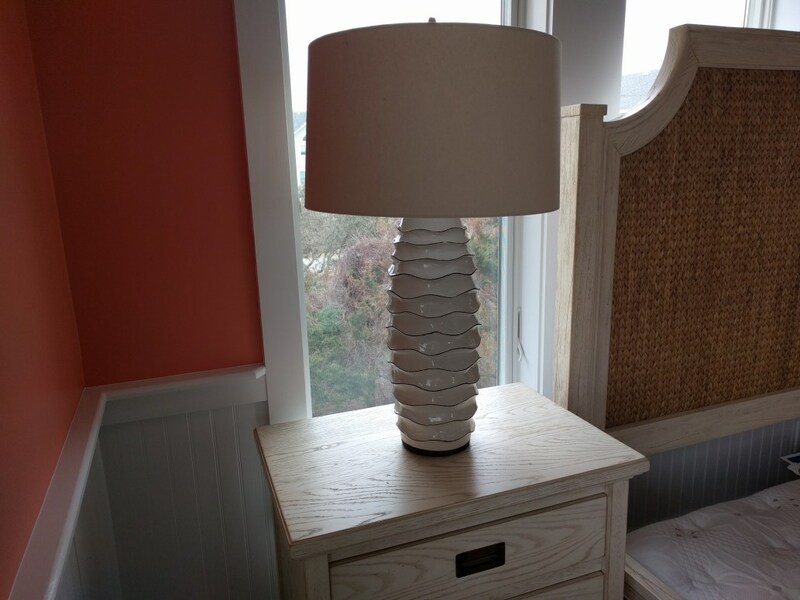 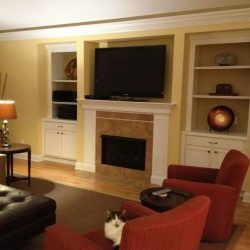 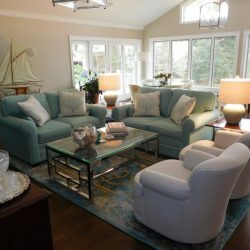 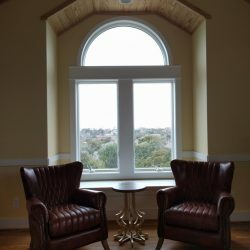 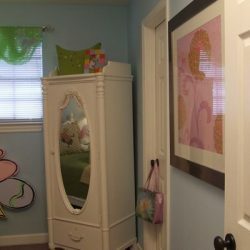 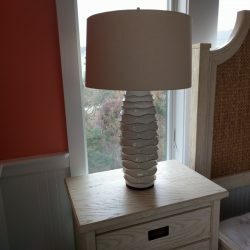 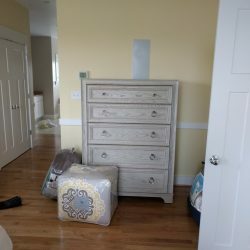 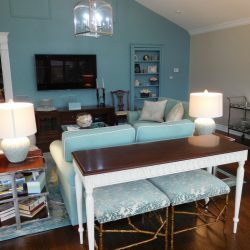 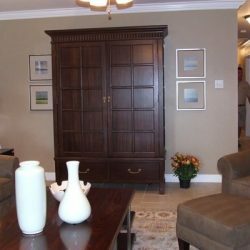 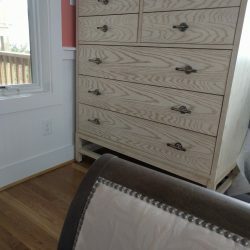 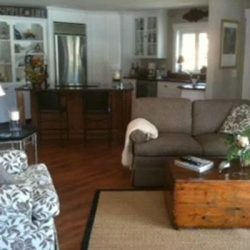 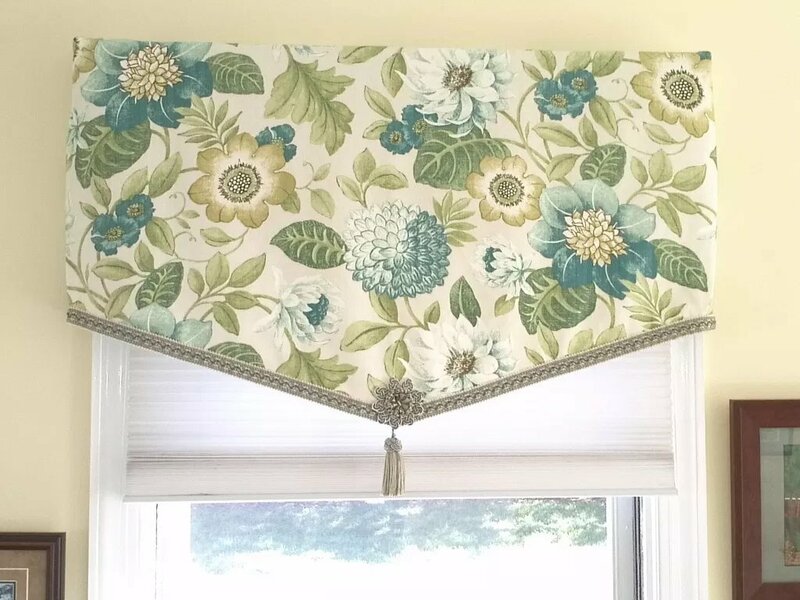 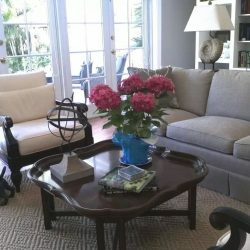 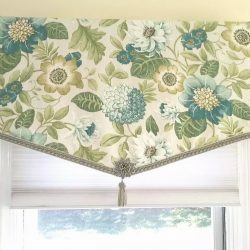 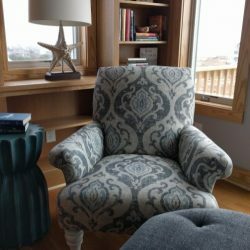 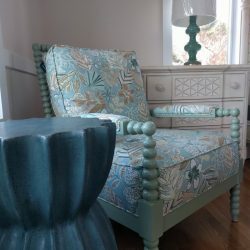 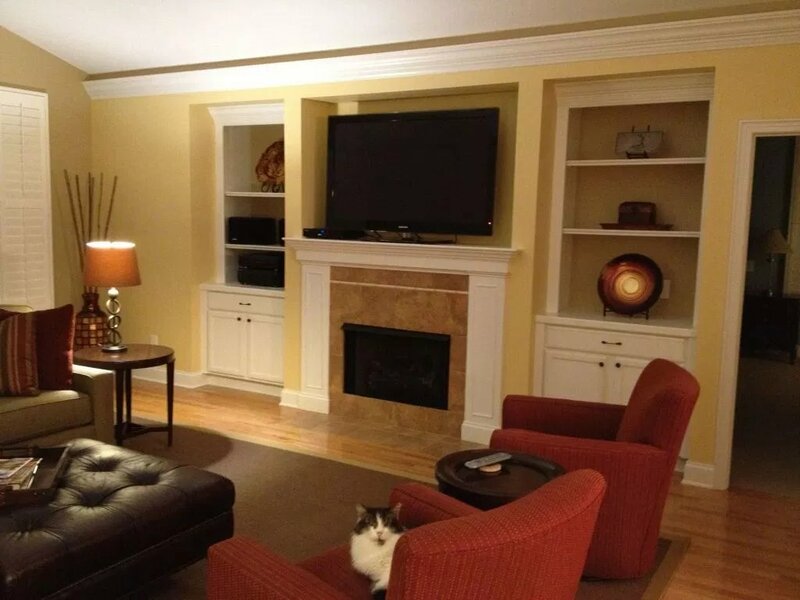 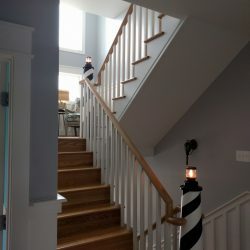 In 2017, Kathy Gordon Interiors was selected to participate. 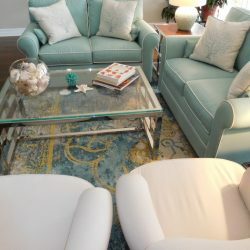 Four teams competed head-to-head using only furniture and accessories from the Ashley Interiors showroom floor (each team started with only a neutral sofa in their space!) 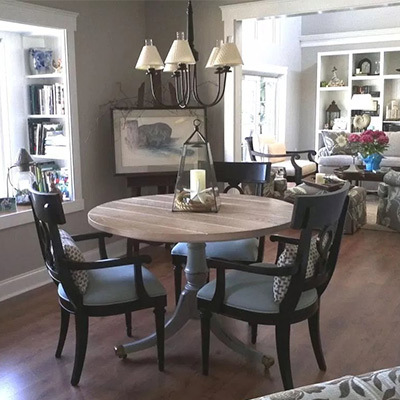 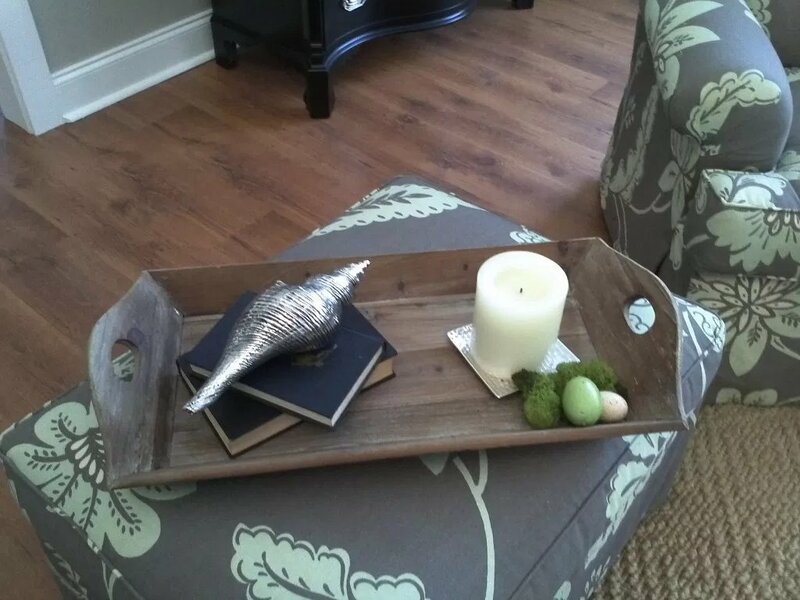 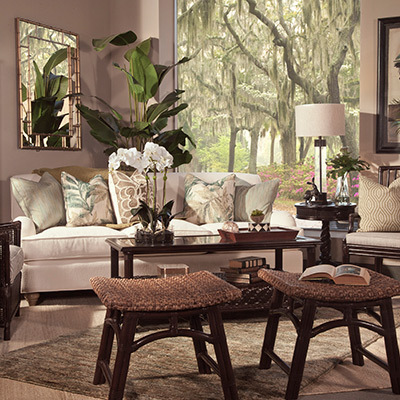 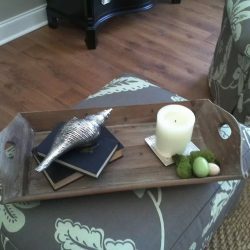 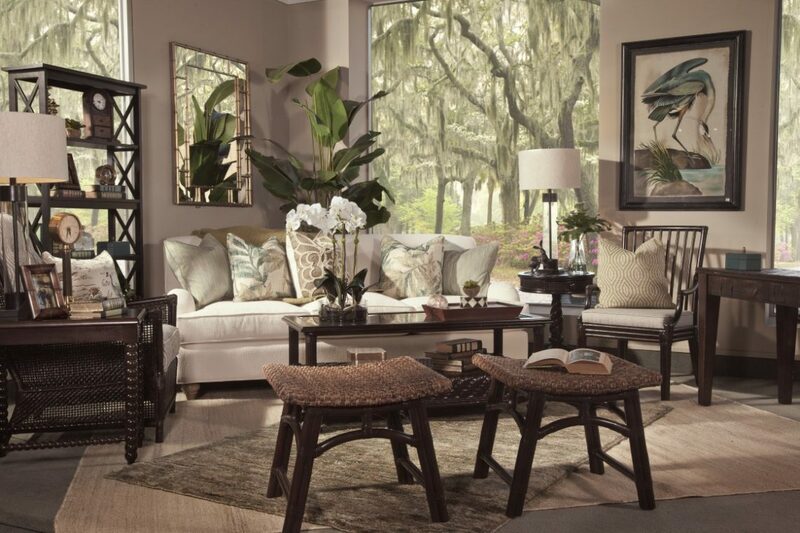 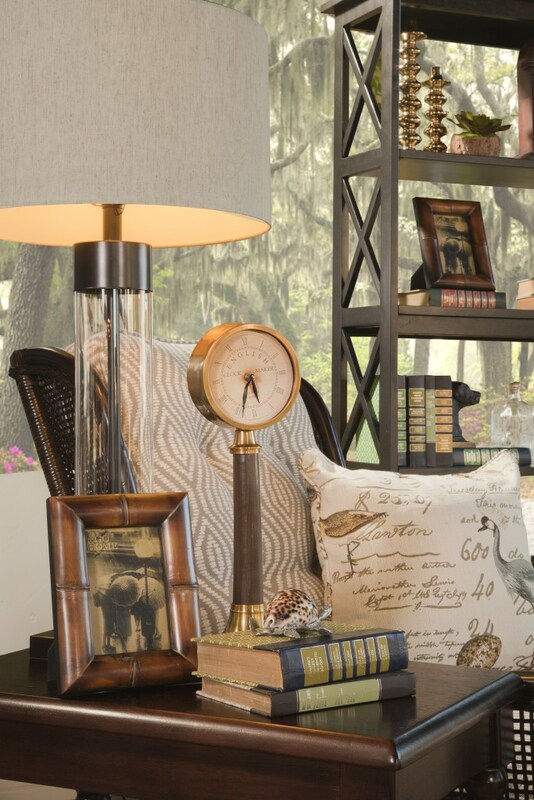 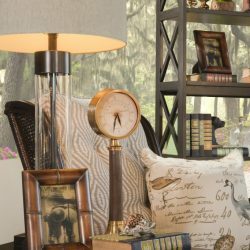 All teams drew an address from a hat – Kathy Gordon Interiors picked Savannah, GA. 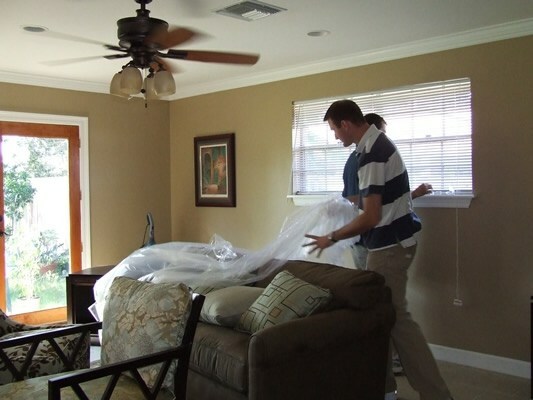 Teams then had an hour to “shop” and ONLY a half-hour to design their space. 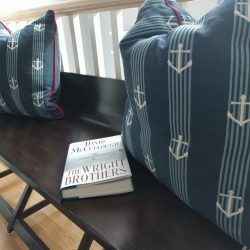 Addresses for this competition included also included addresses from, Chicago, IL, Key West, FL, and Nantucket, MA. 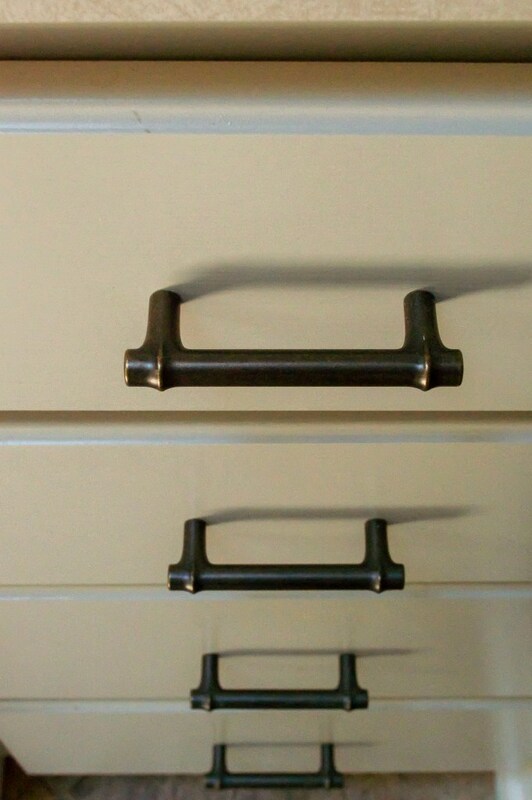 Clock’s started; pressure was on. 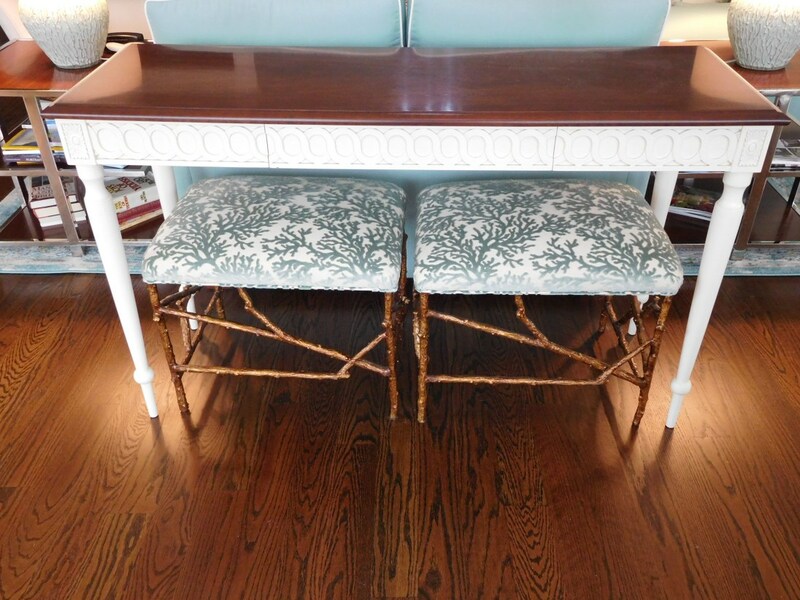 Our design team ran like crazy with a shopping cart, like a bull in a china shop around the showroom floor. 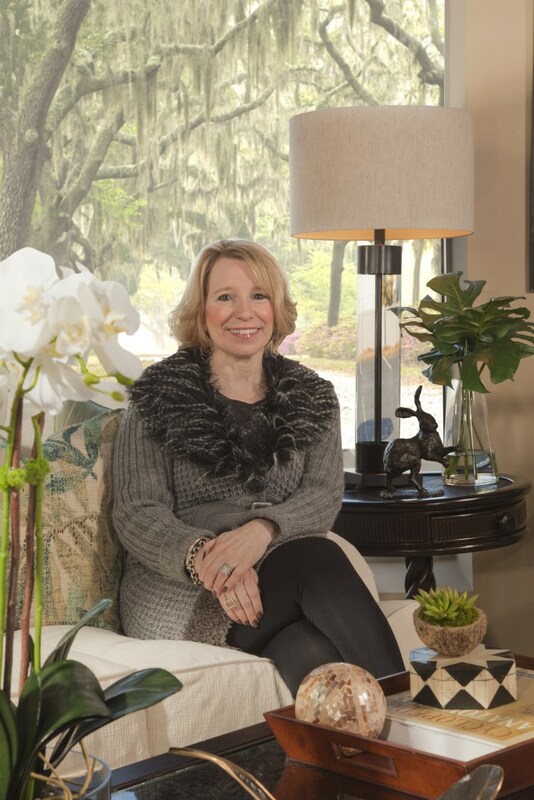 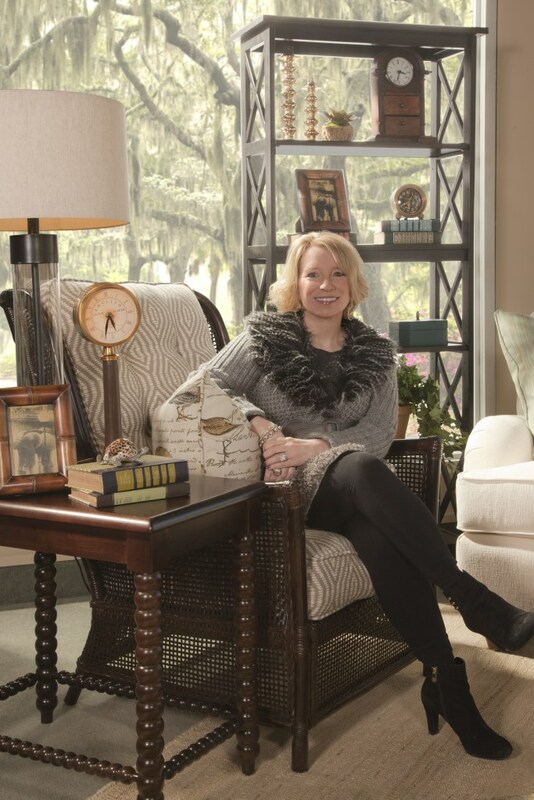 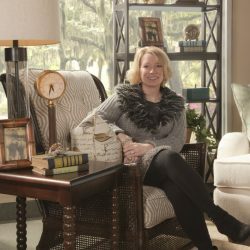 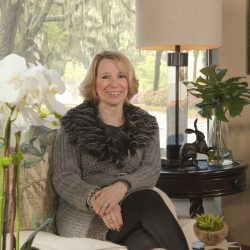 Kathy loved our location because she loves Savannah and all of its rich history. 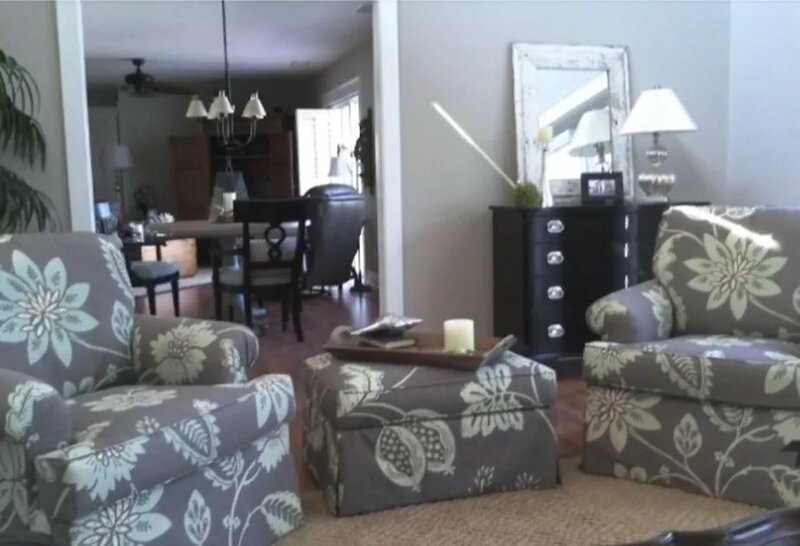 Kathy really enjoyed blending the traditional accessories with neutral and playful fabrics to give the Kathy Gordon Interiors space a contemporary spin. 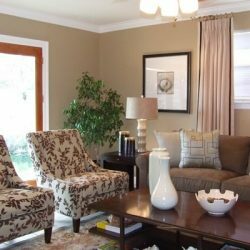 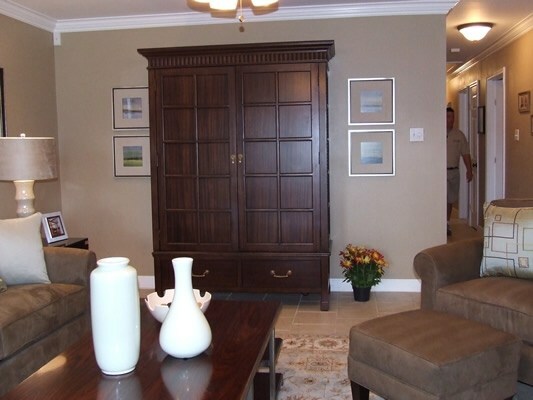 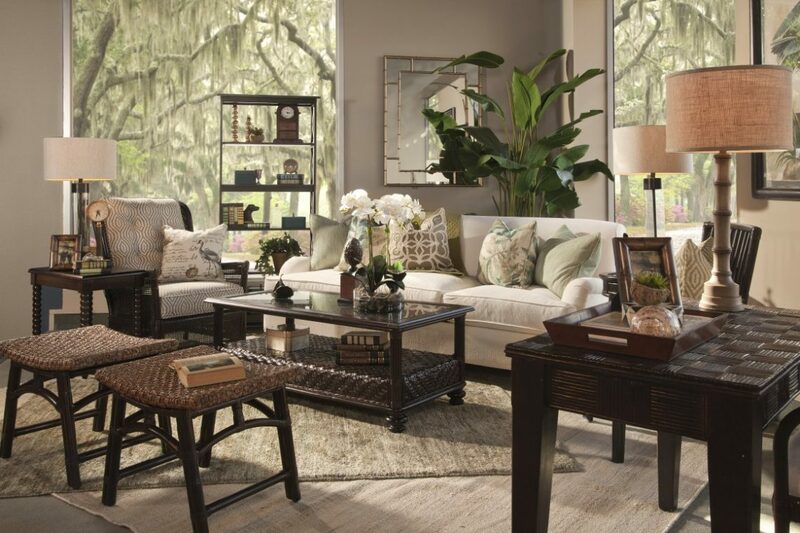 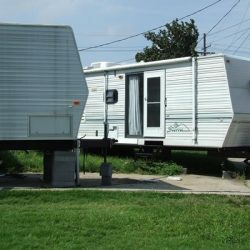 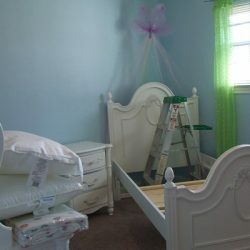 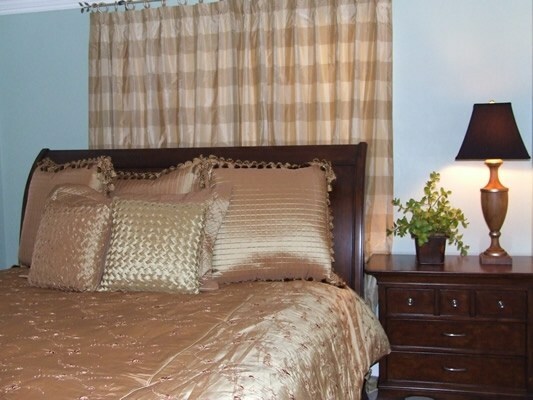 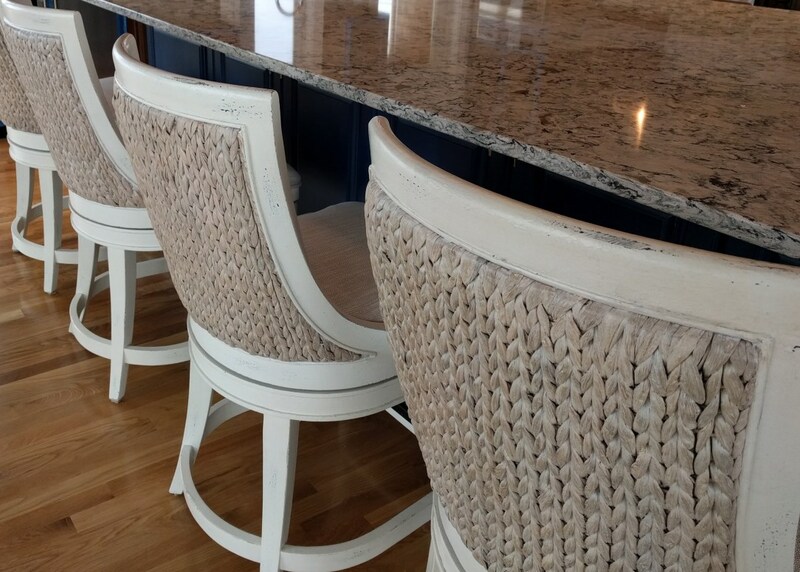 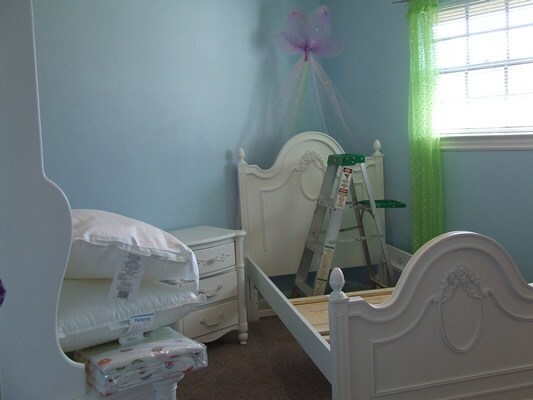 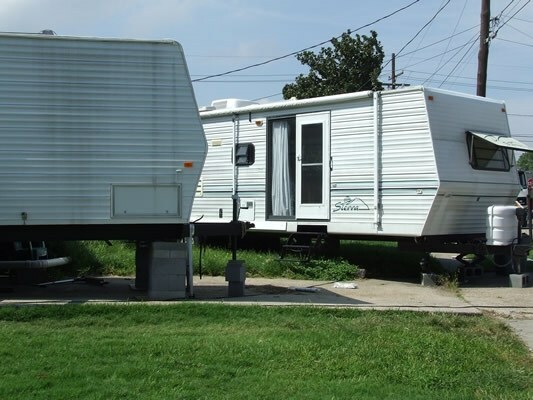 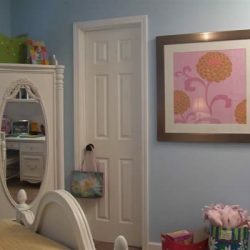 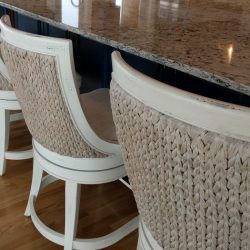 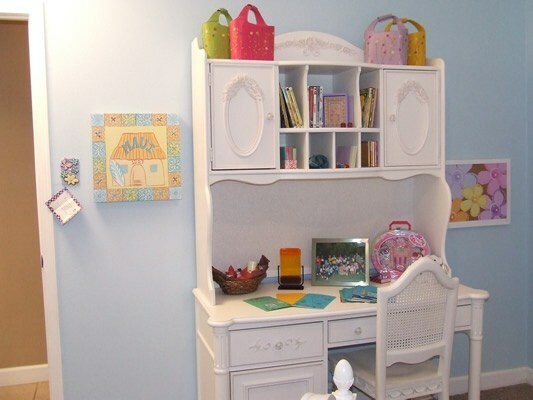 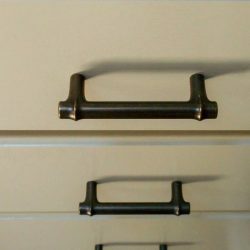 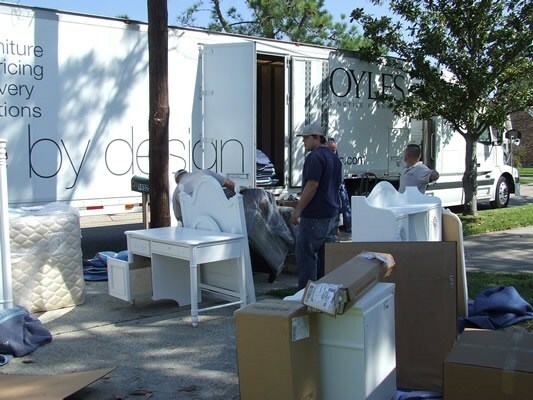 After Hurricane Katrina devastated New Orleans in 2006, Boyles Furniture was contacted by the Dr. Phil Show and DIY Network for help with a series of charitable design projects to help get three families back into their homes. 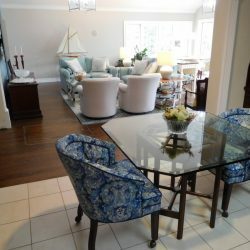 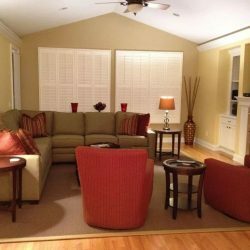 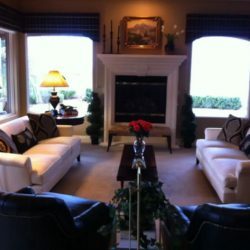 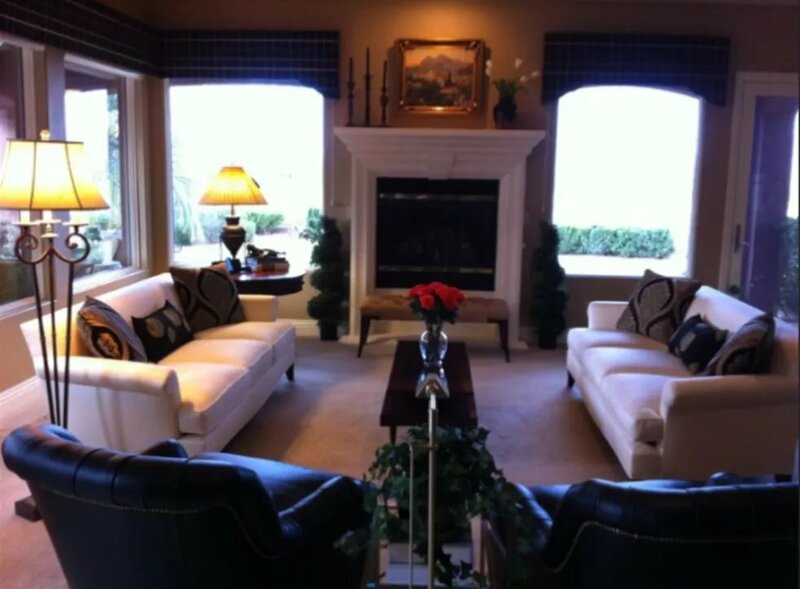 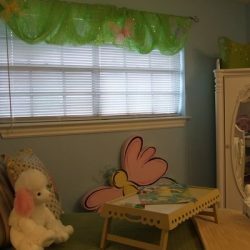 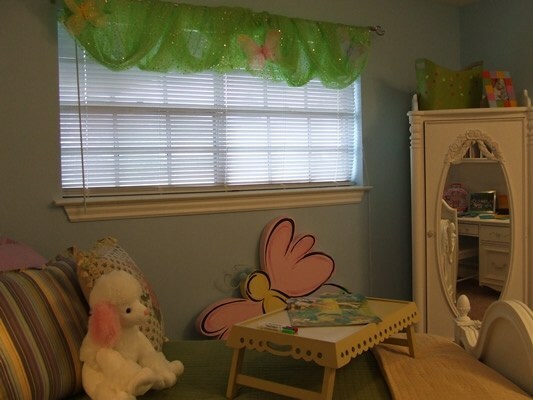 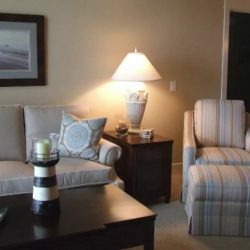 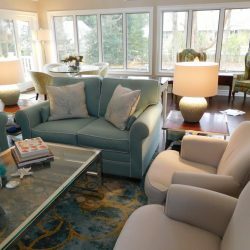 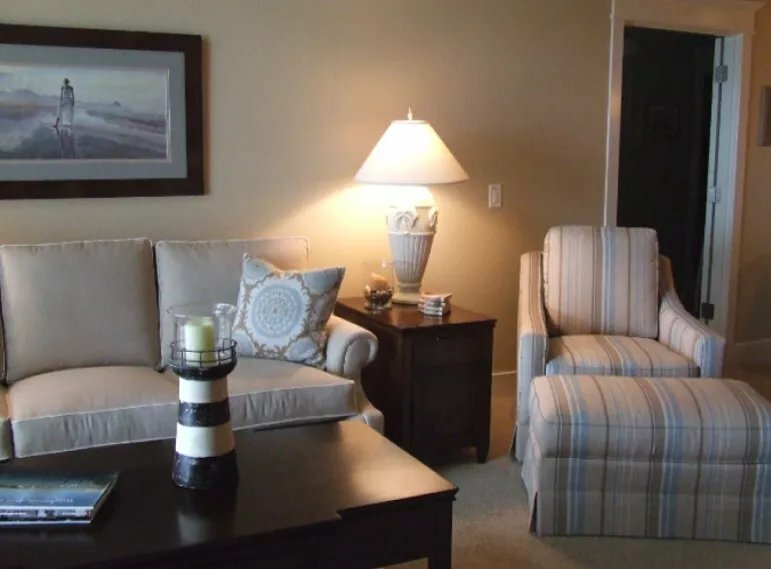 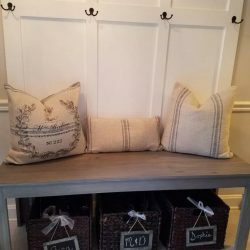 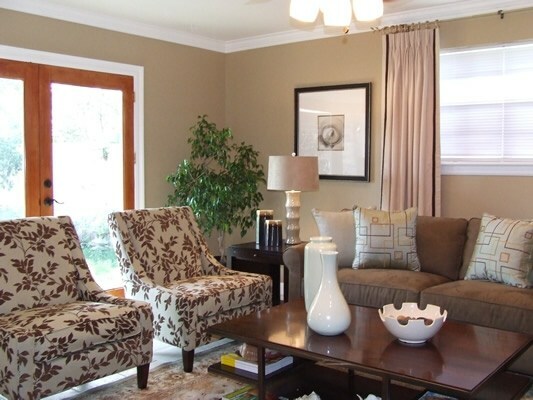 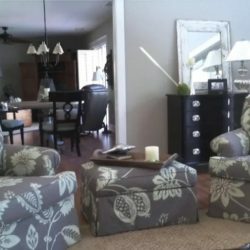 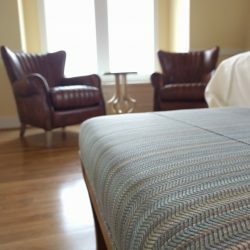 Kathy was selected to work with one of these families to select furniture, accessories, mattresses and window treatments for their new spaces. 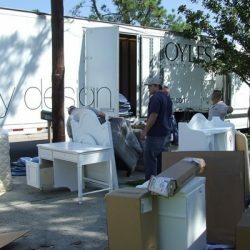 Kathy and her team then filled the truck and headed to New Orleans for the installation. 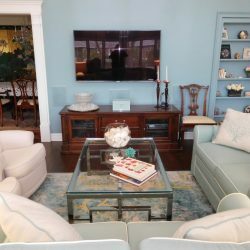 On Friday October 27, 2006 the Dr. Phil Show surprised the families with the reveal of their homes restored and furnished. 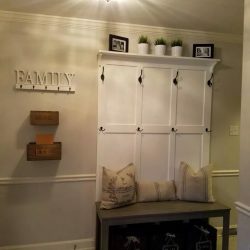 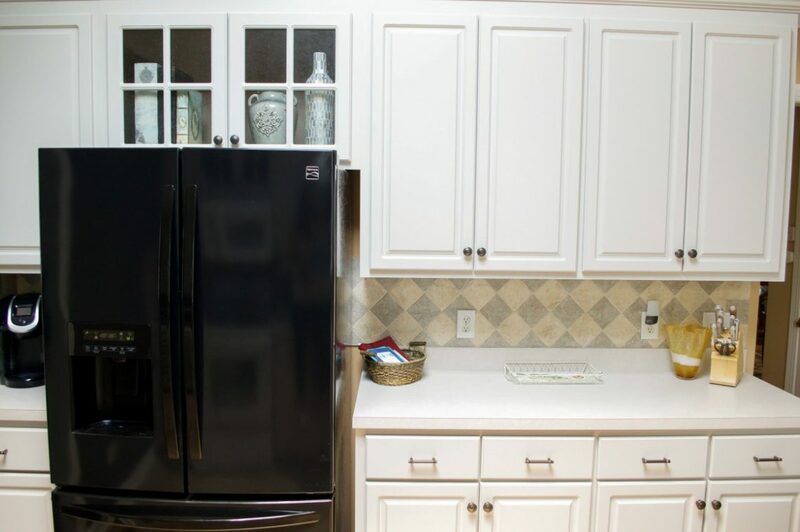 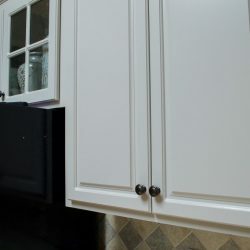 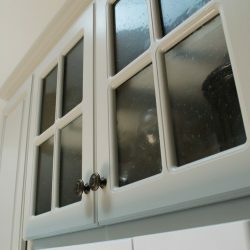 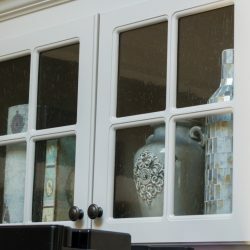 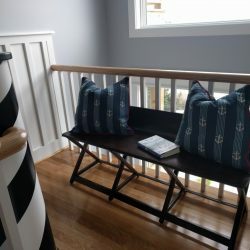 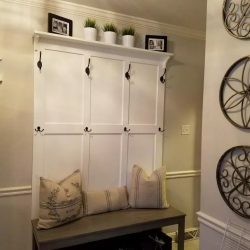 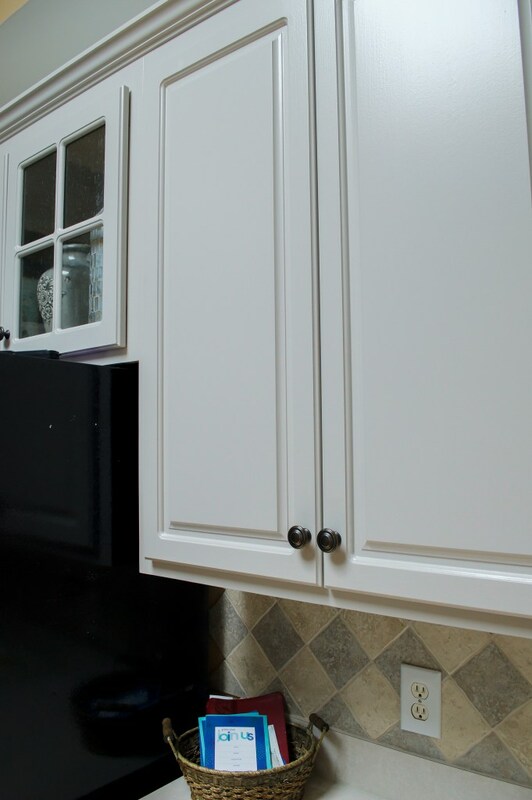 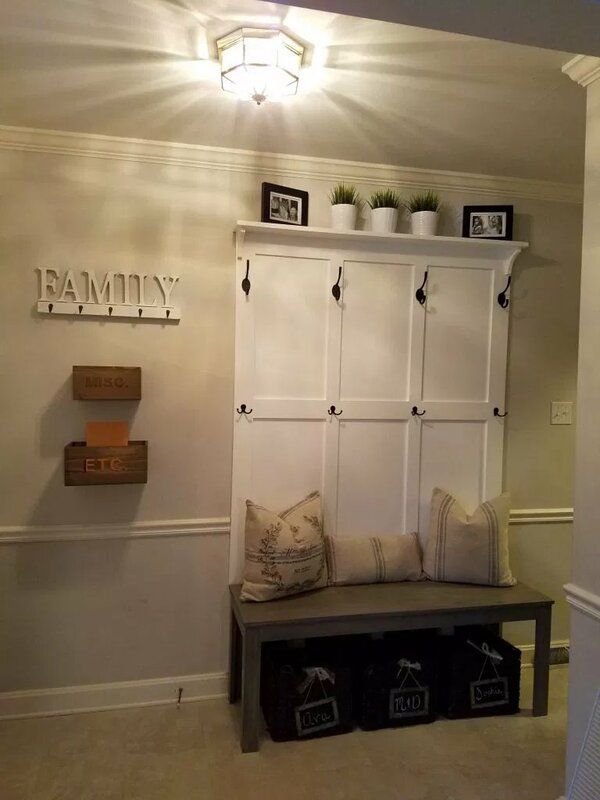 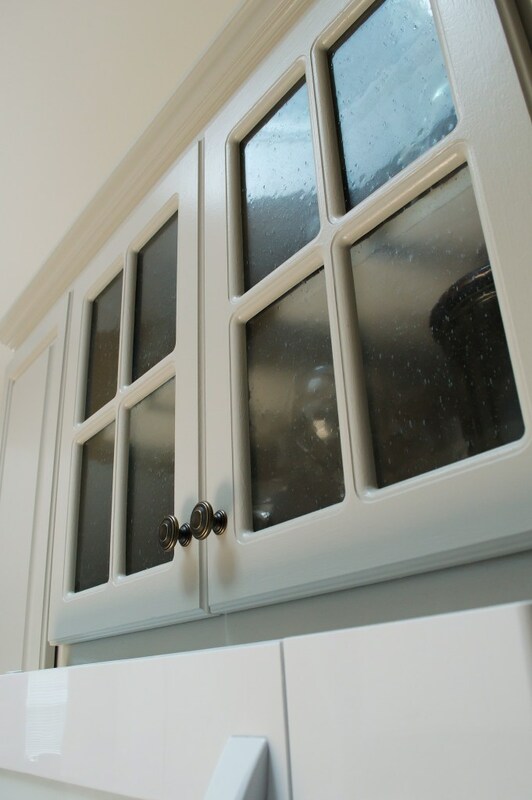 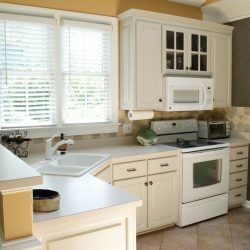 The farmhouse look is everywhere these days, but what if you don’t love the matte black and bright white that defines the trend and instead want something warmer that still has the same feel that combines transitional style with traditional comfort? 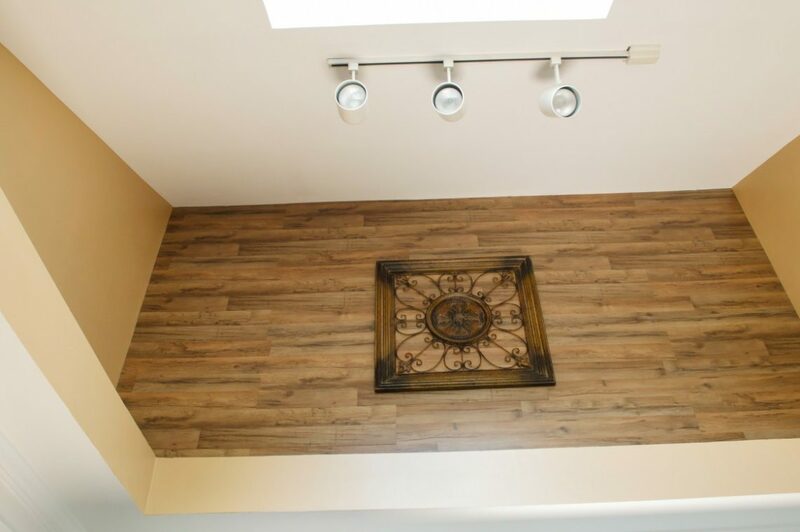 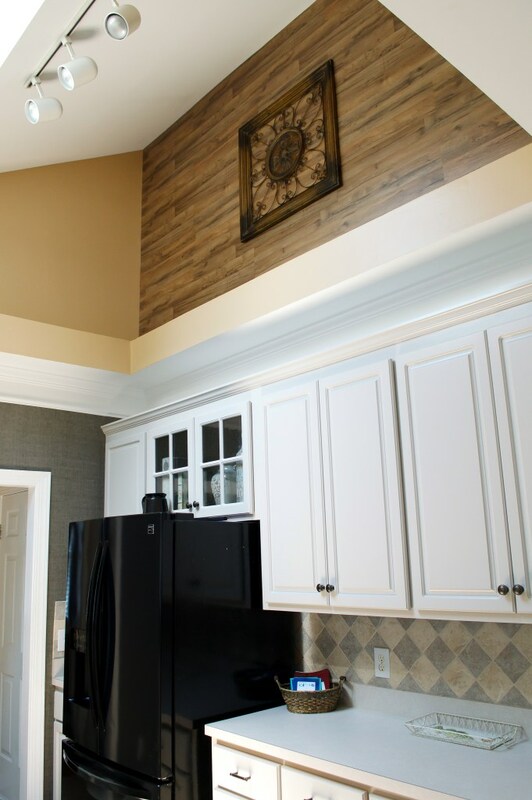 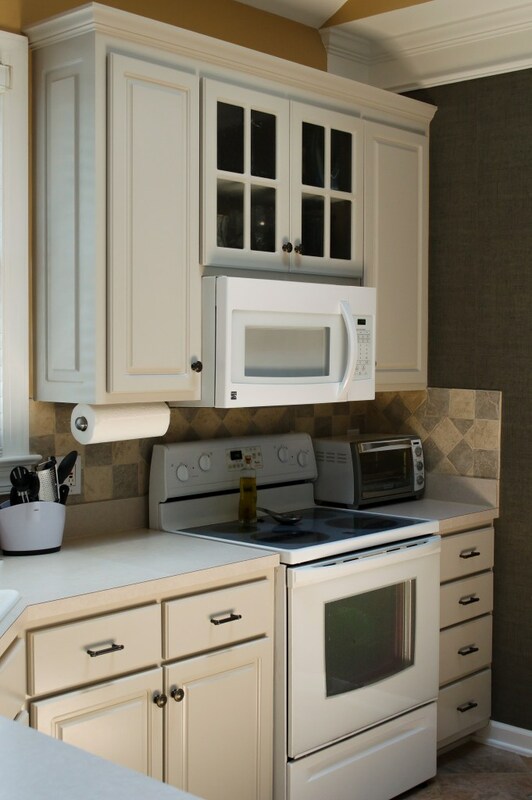 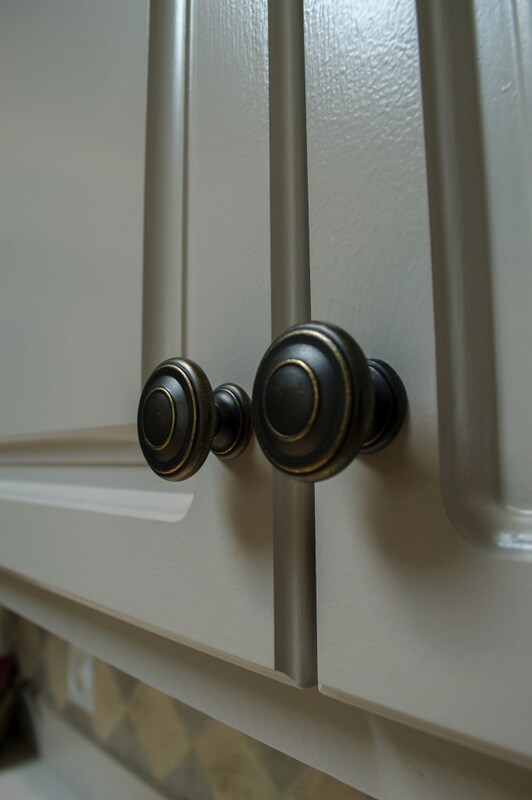 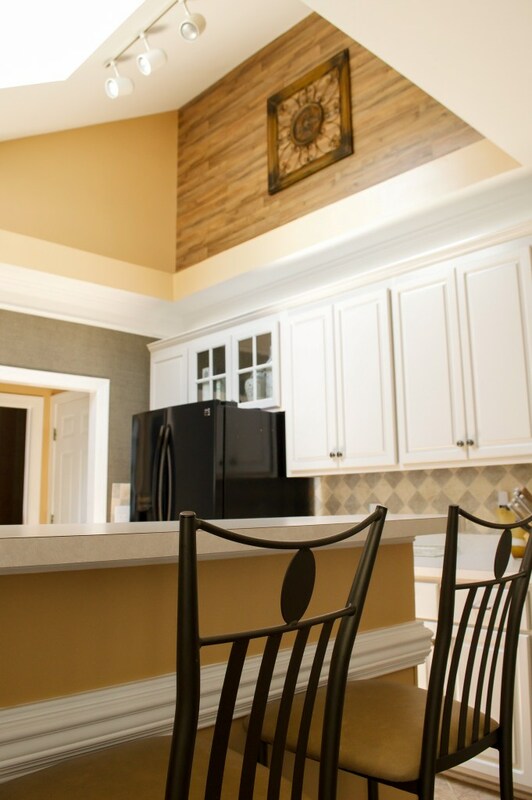 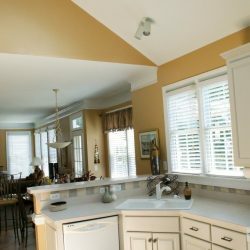 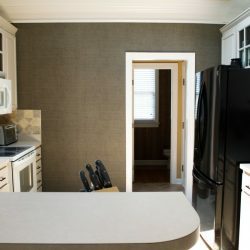 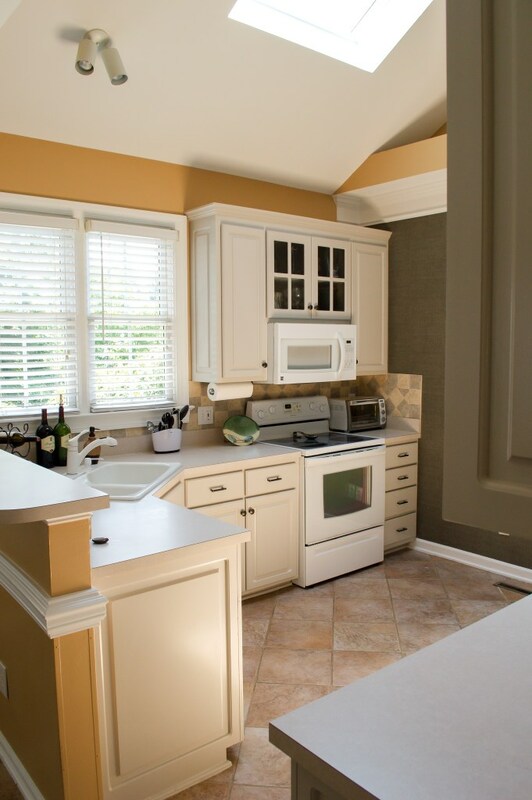 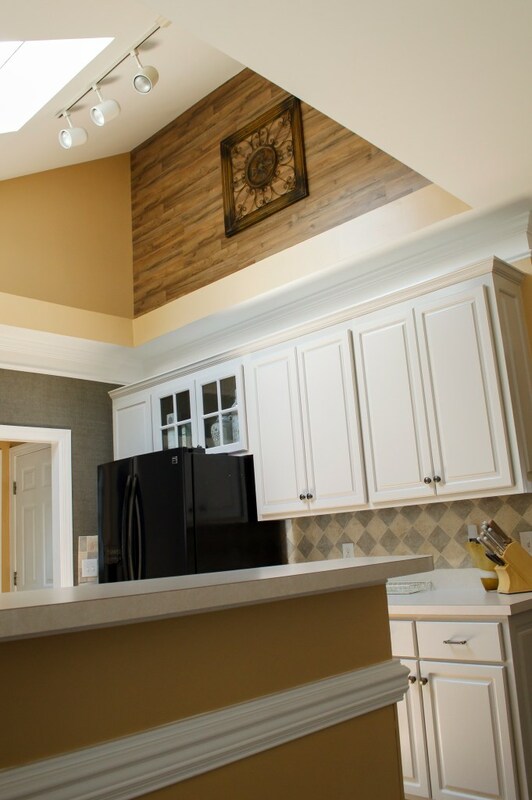 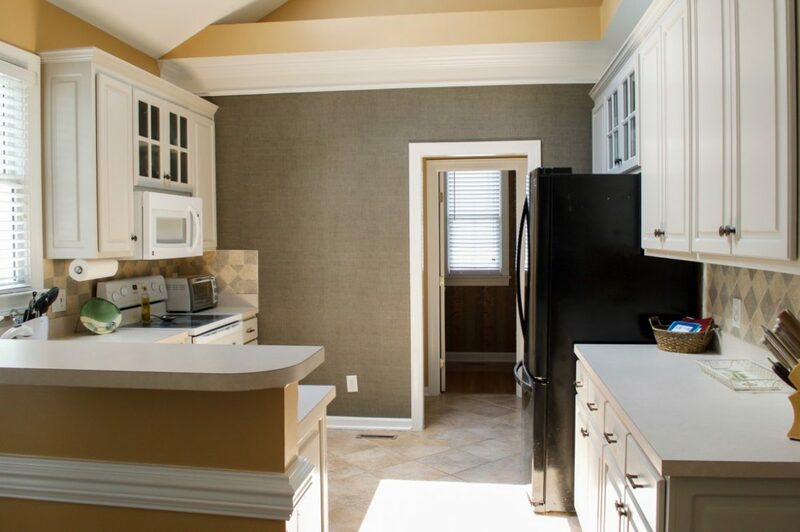 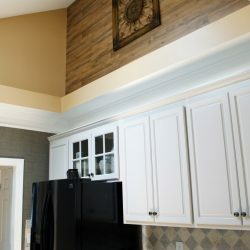 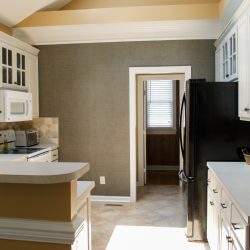 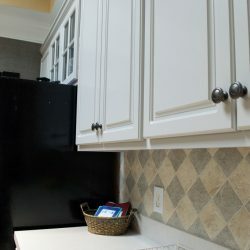 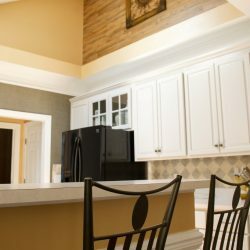 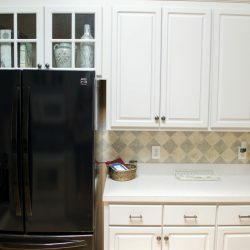 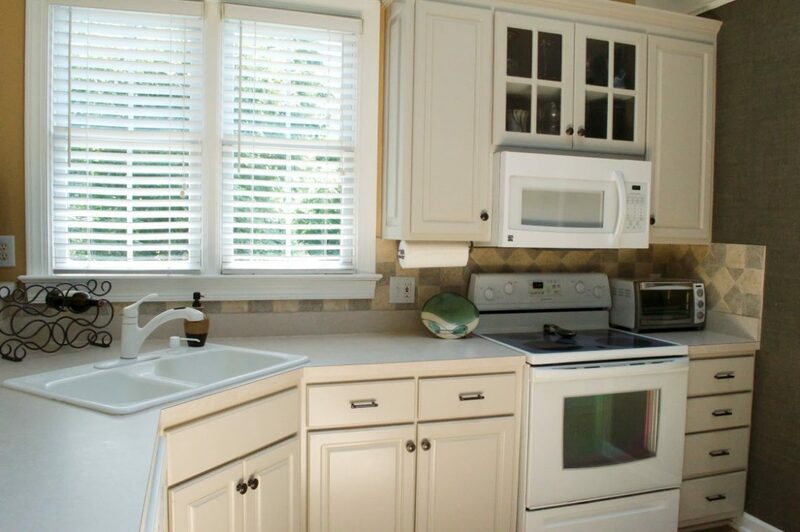 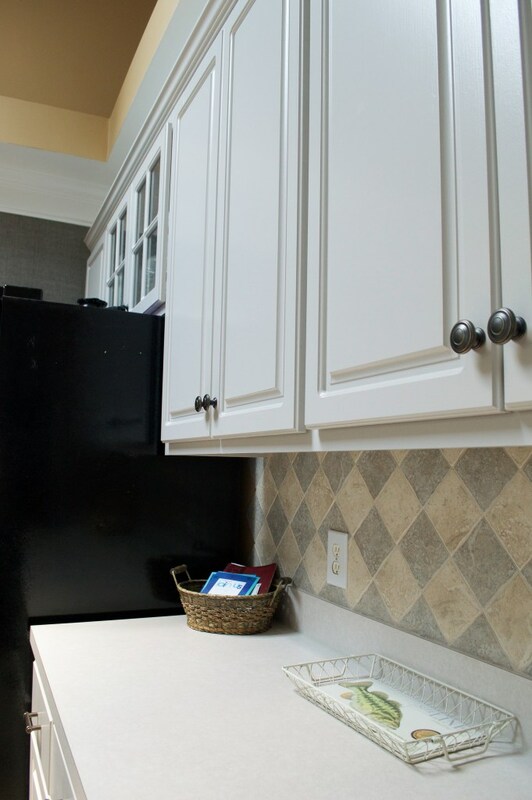 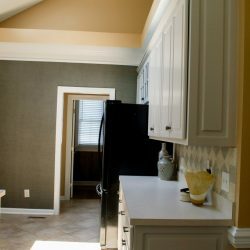 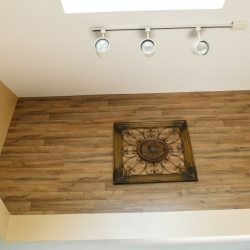 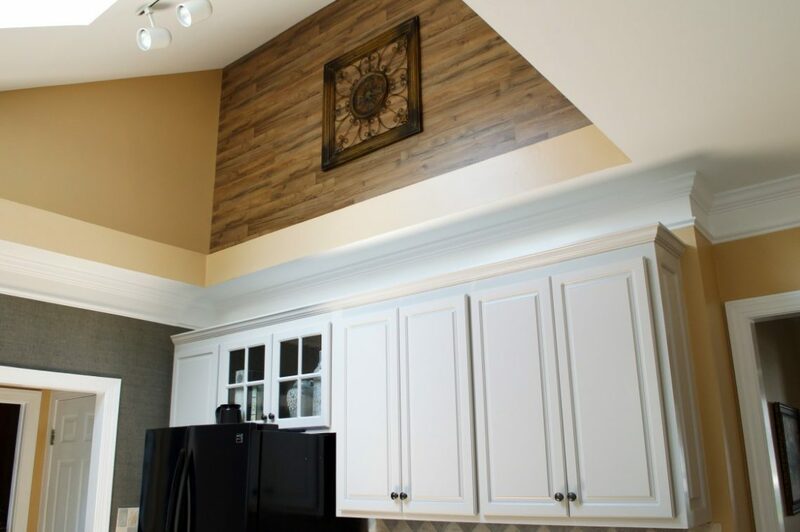 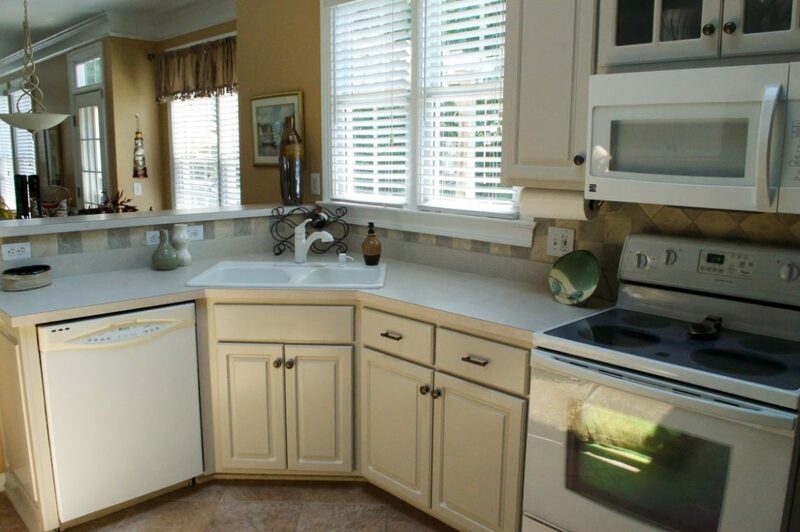 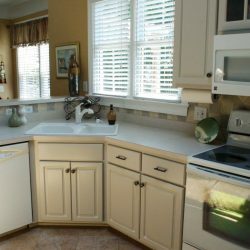 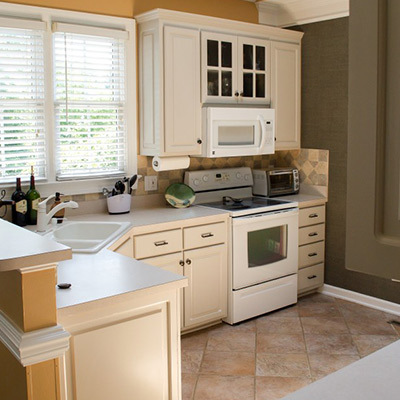 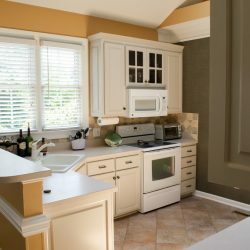 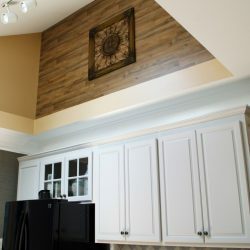 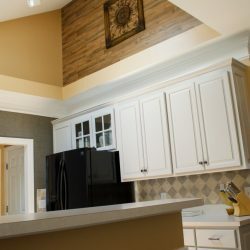 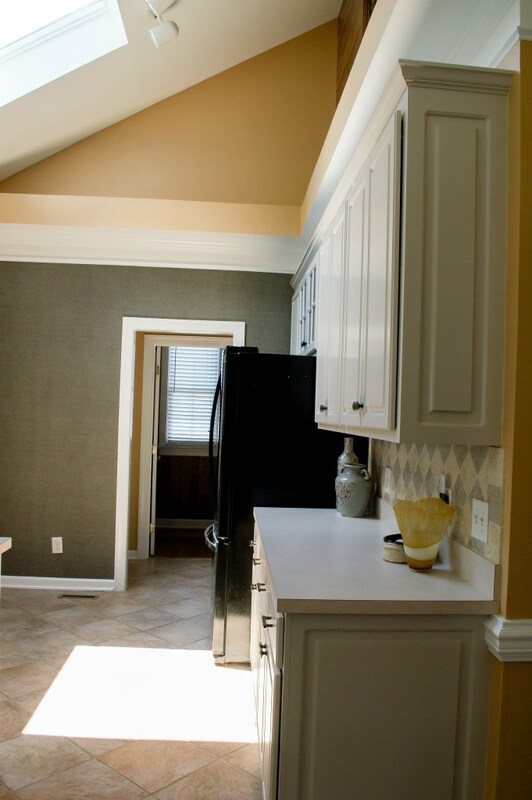 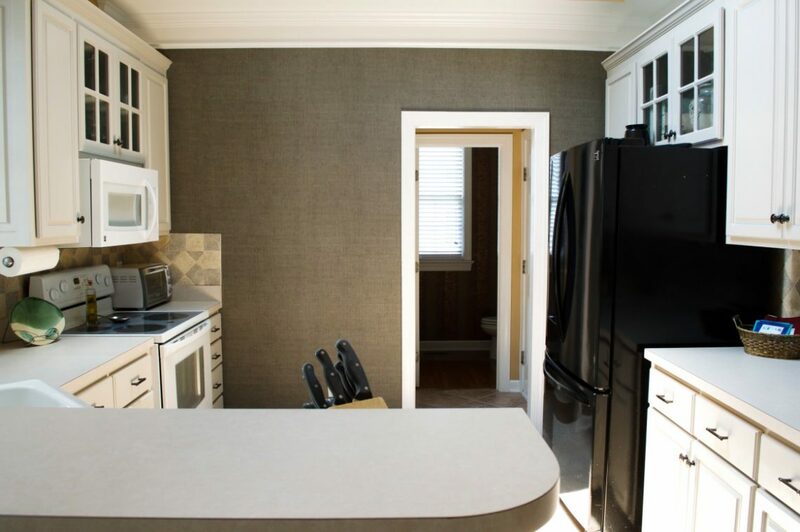 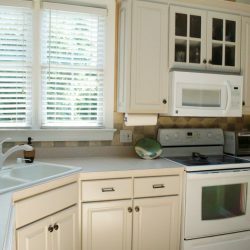 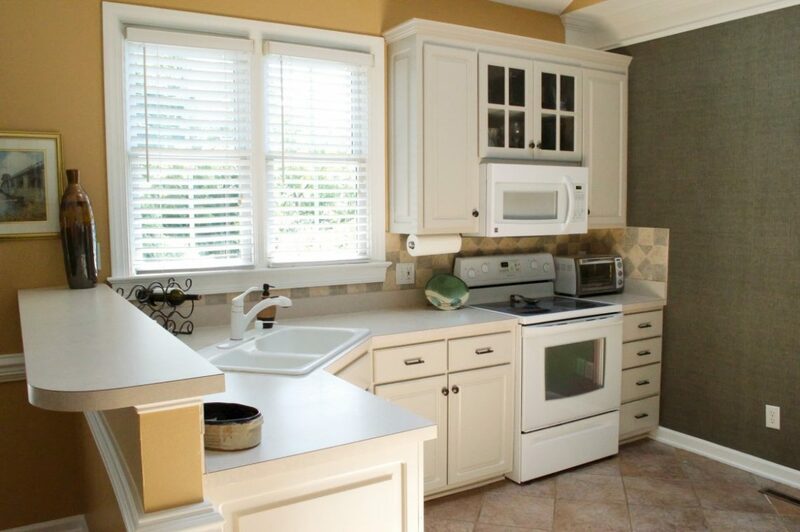 This is what we did for this kitchen, located in central Carolina using hand rubbed oil bronzed finishes and installing an accent wall with a reclaimed-wood feel that steals the show.